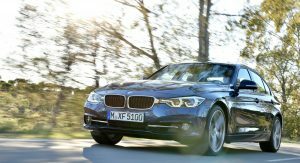 You’ve probably gone through the first pics and details on the Euro BMW 3-Series LCI, so aside from a boatload of fresh photos and videos, we’ll give you the rundown on the North American model. 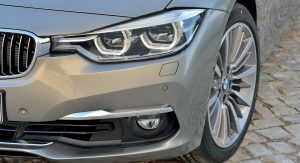 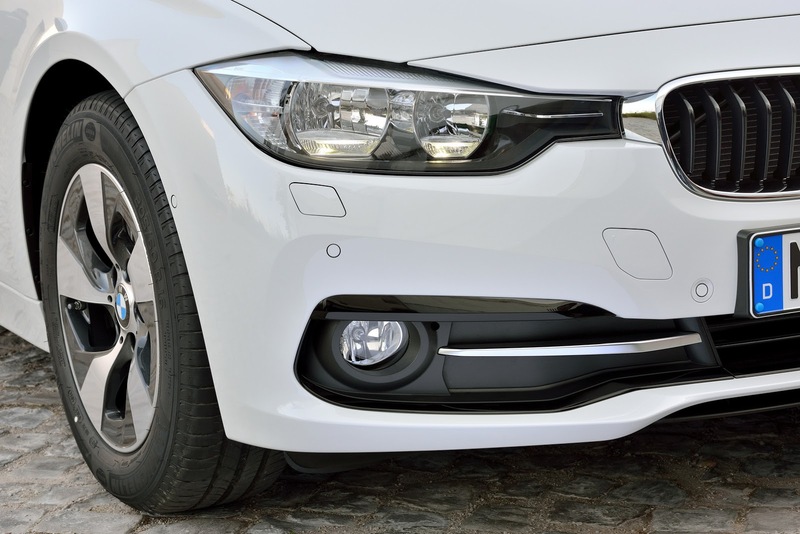 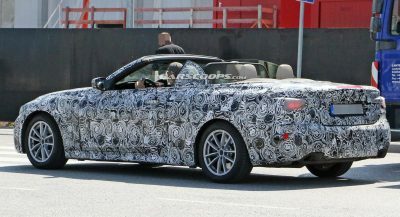 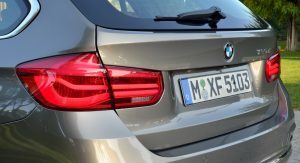 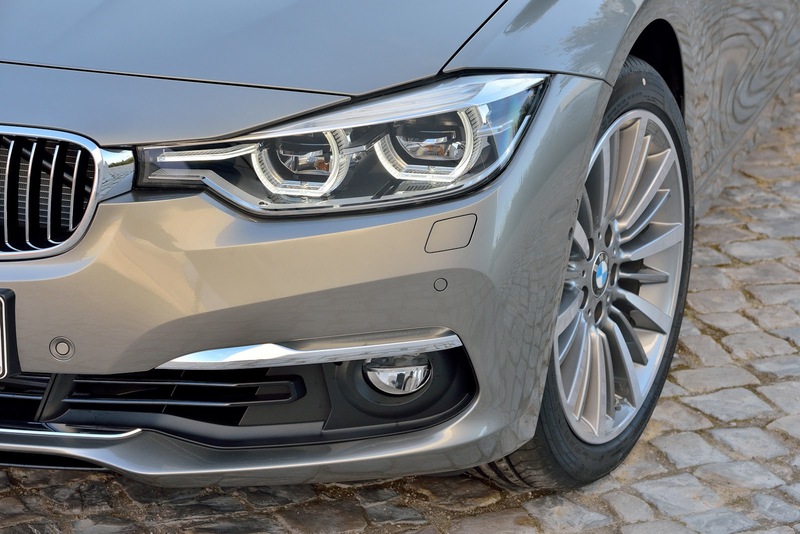 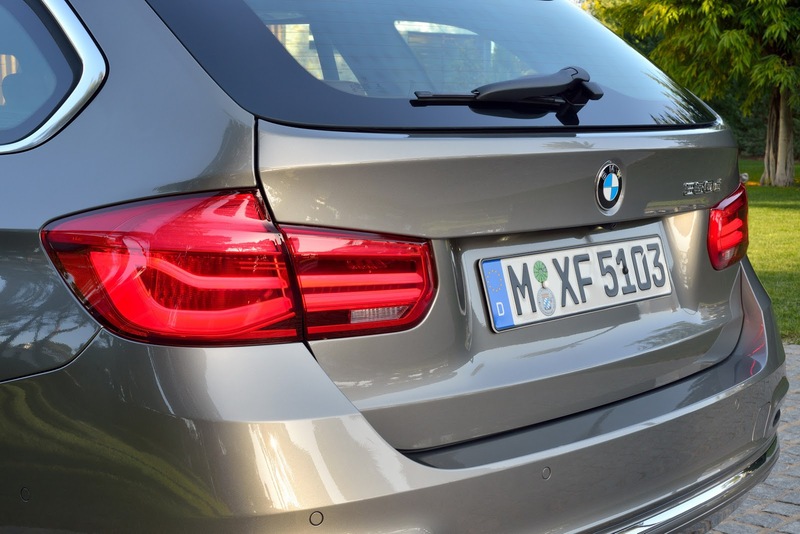 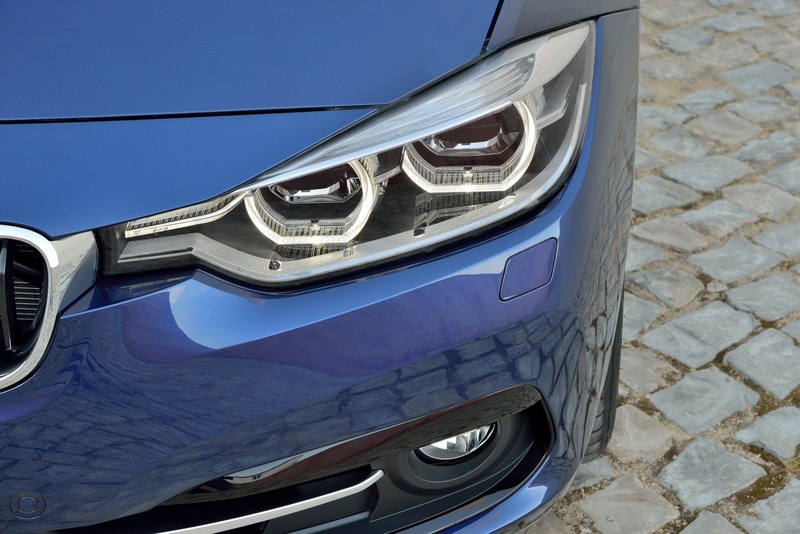 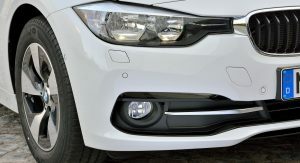 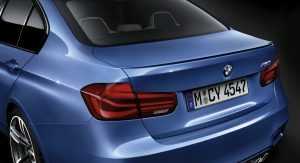 On the outside, they include tweaked bumpers on both ends, new halogen headlights with LED daytime running lights or optional full-LED headlamps that are standard on the 340i, new LED tail light clusters and fresh designs for the 17-, 18- and 19-inch alloy wheels. 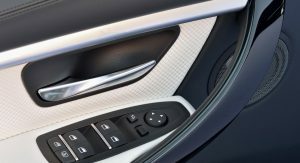 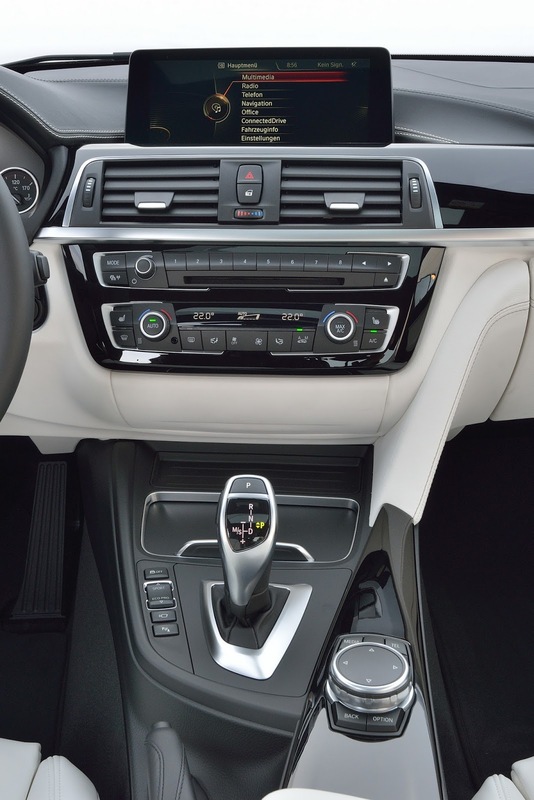 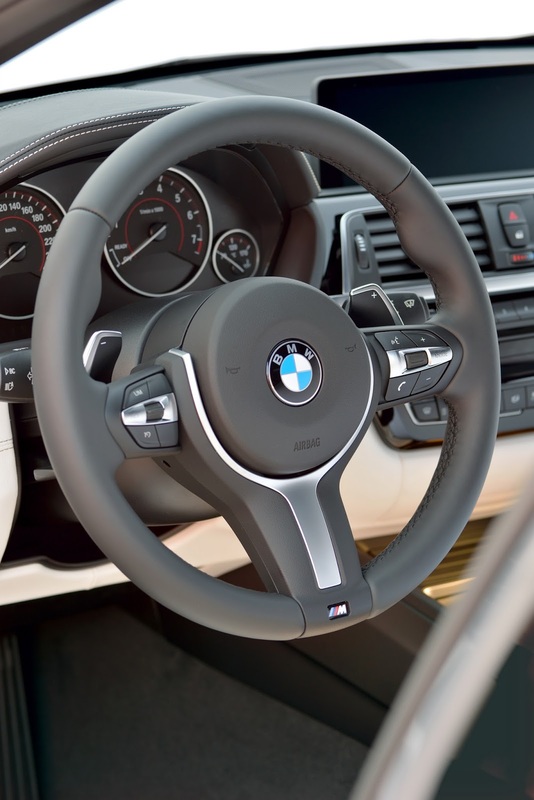 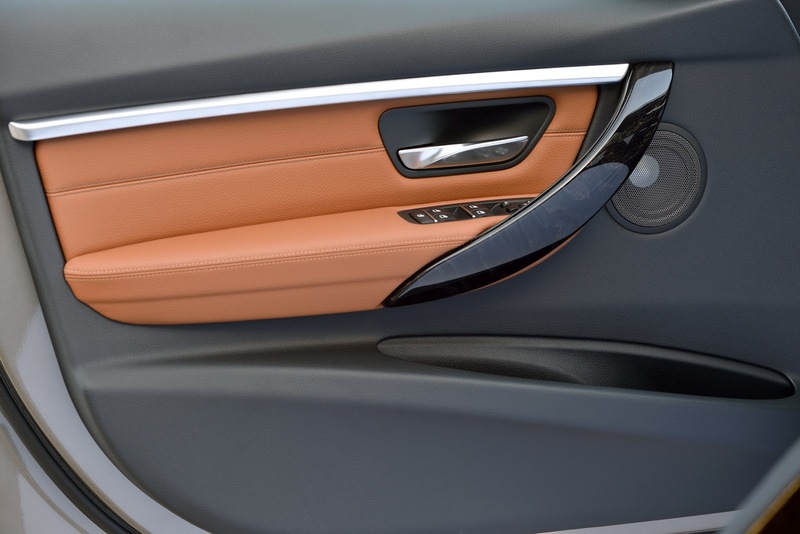 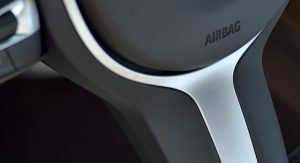 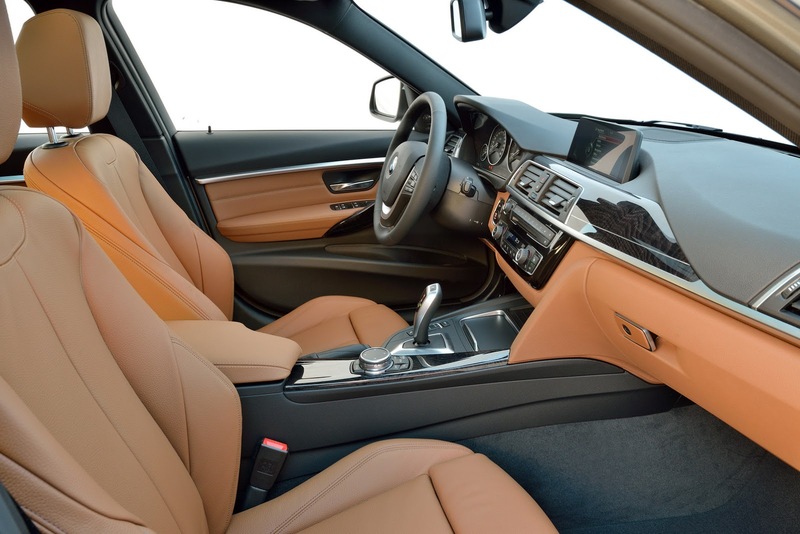 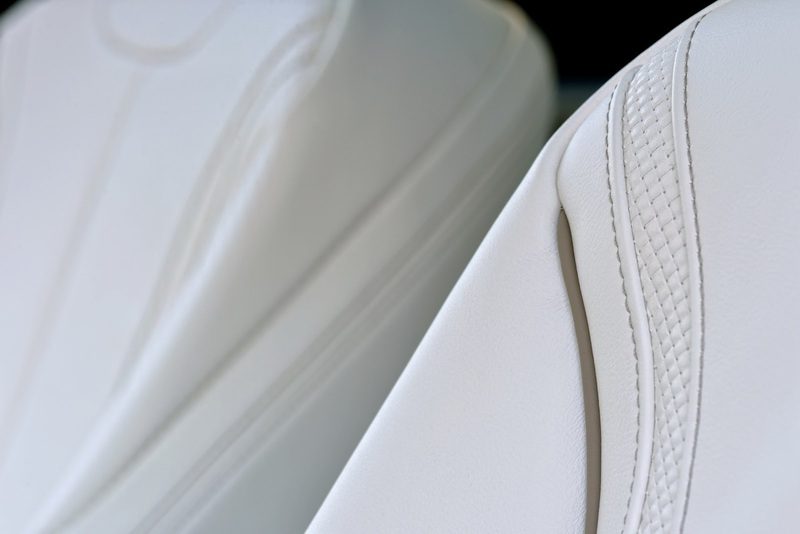 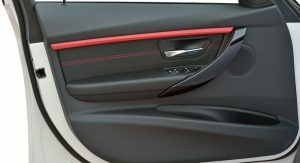 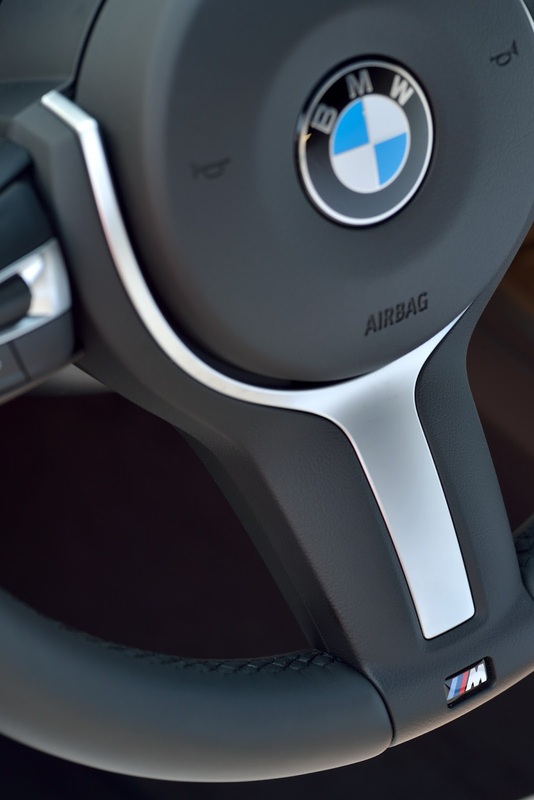 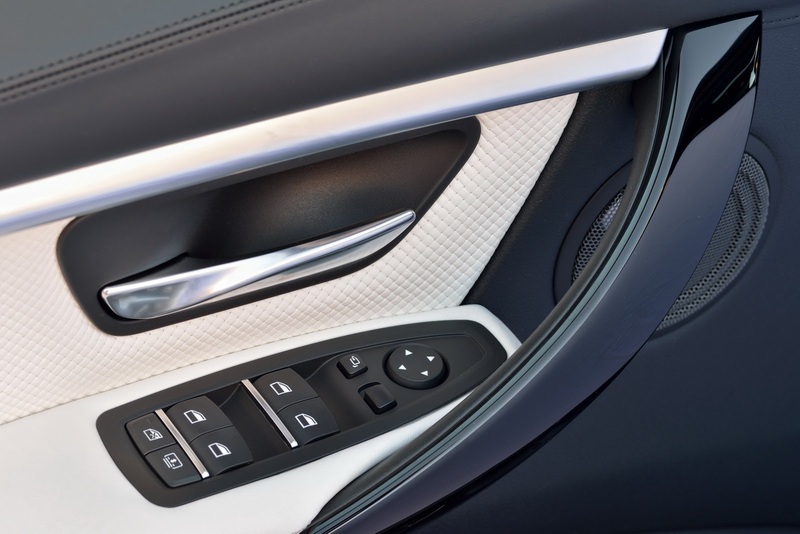 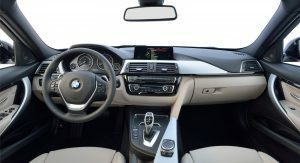 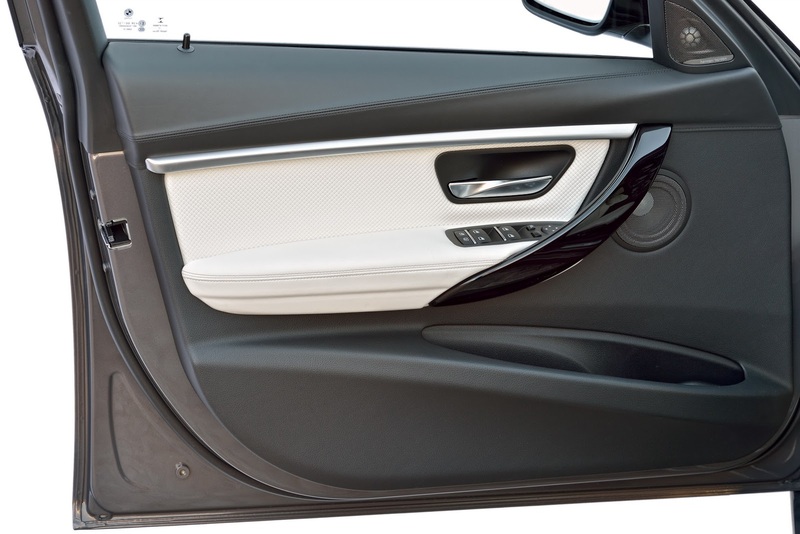 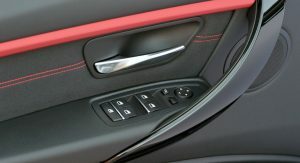 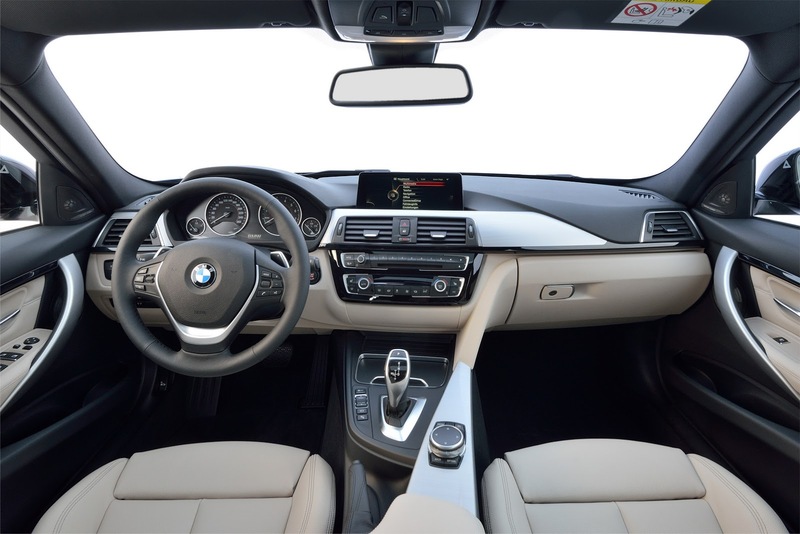 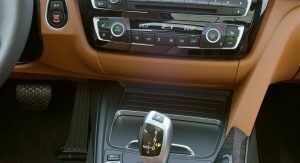 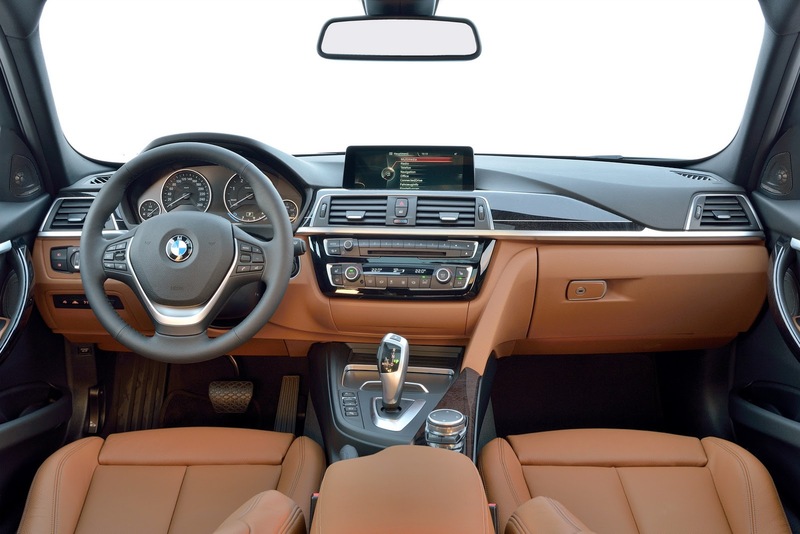 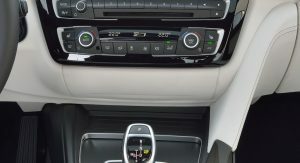 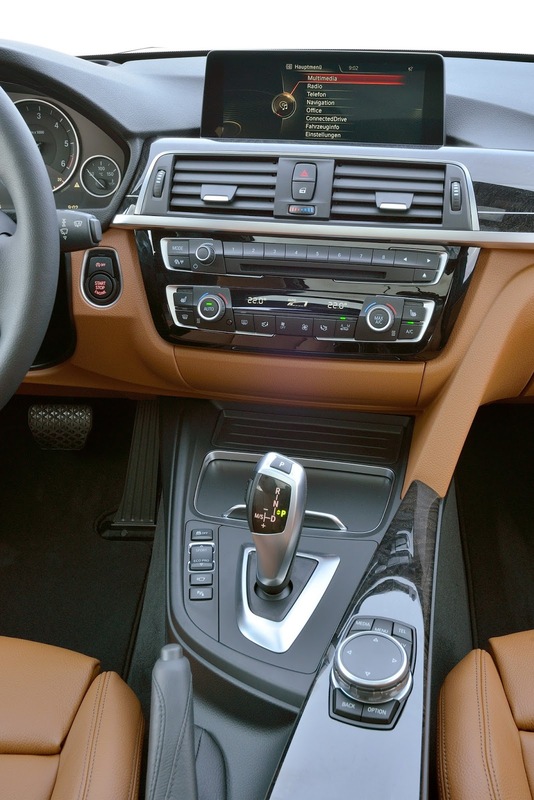 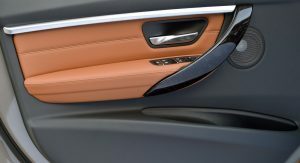 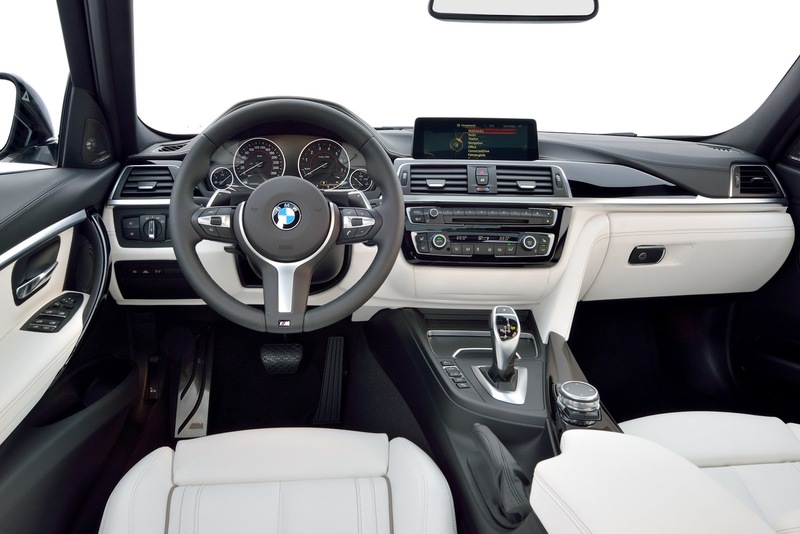 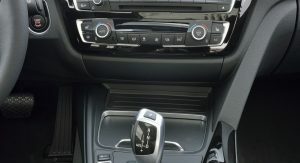 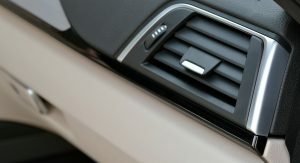 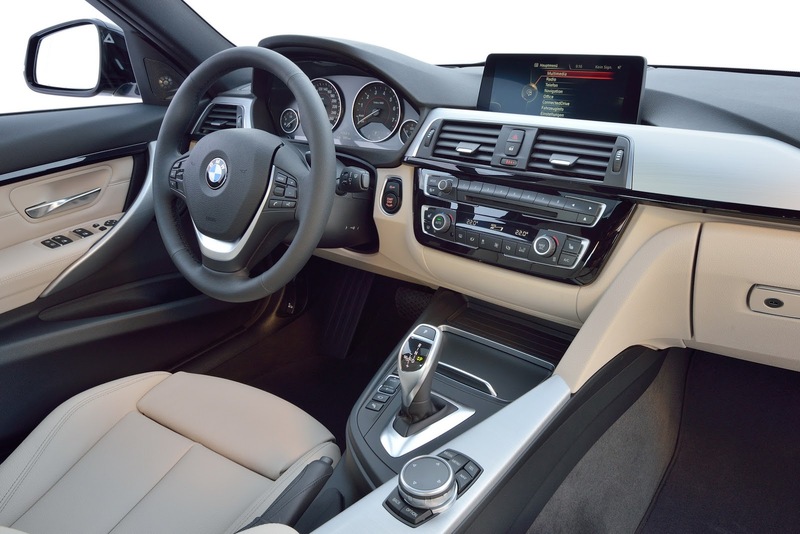 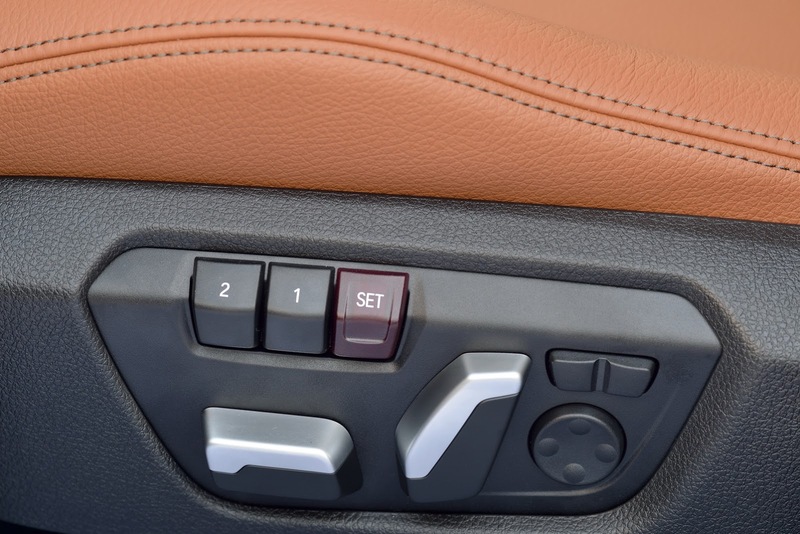 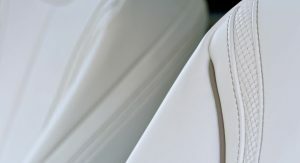 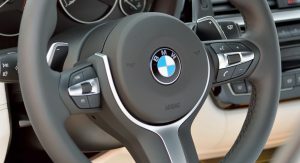 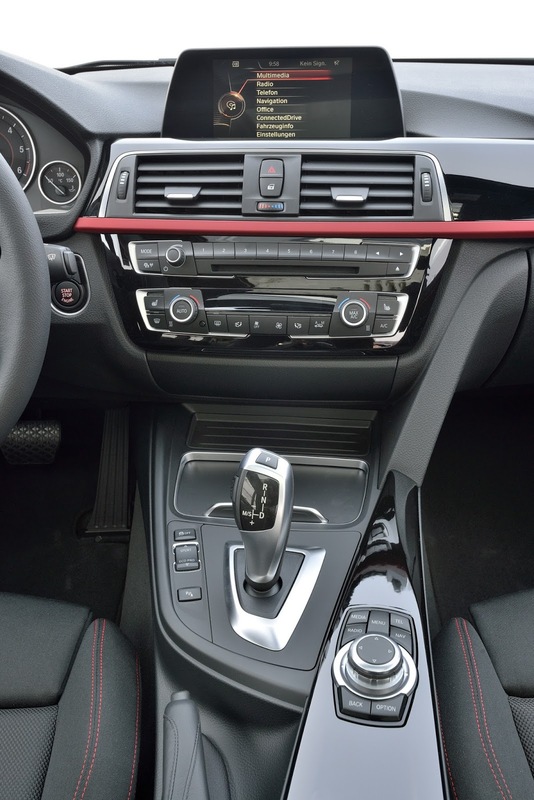 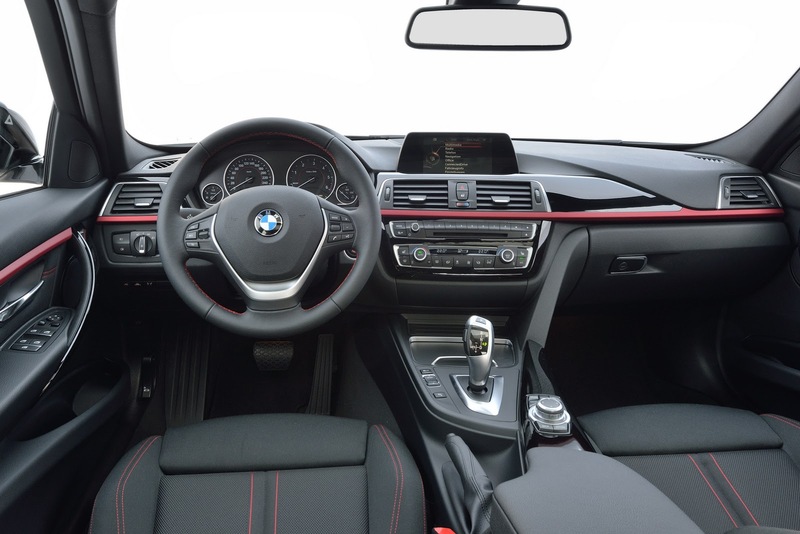 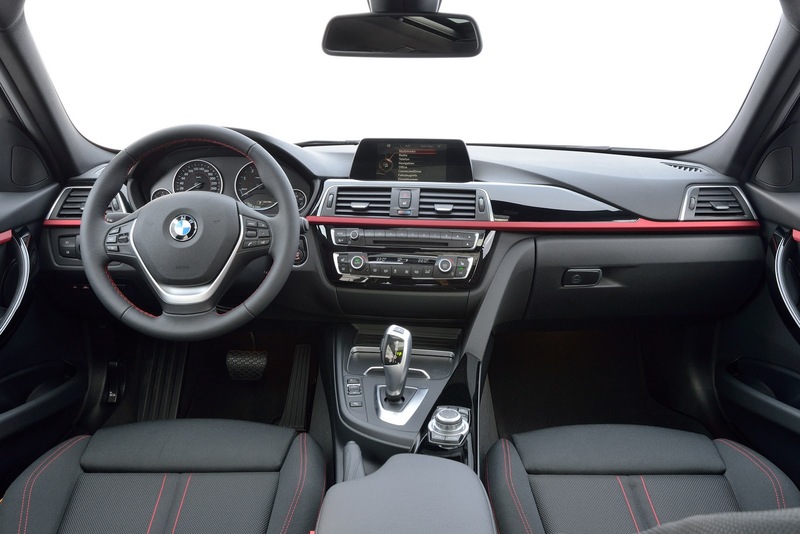 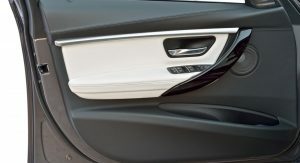 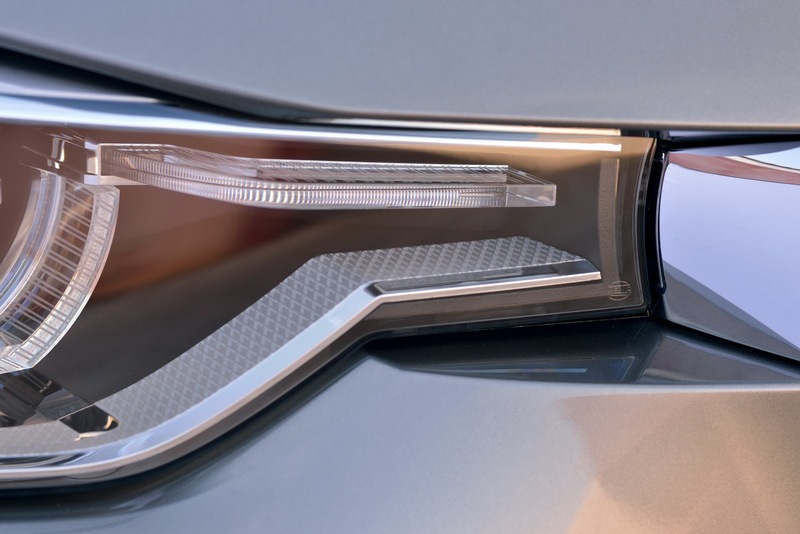 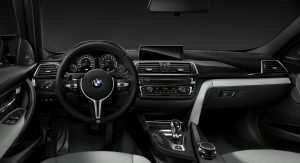 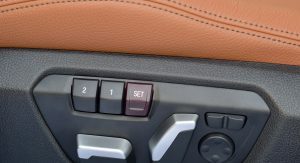 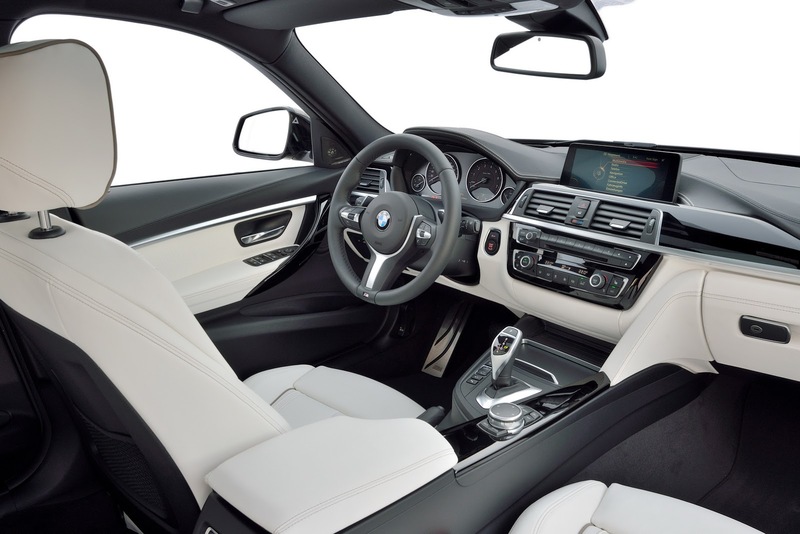 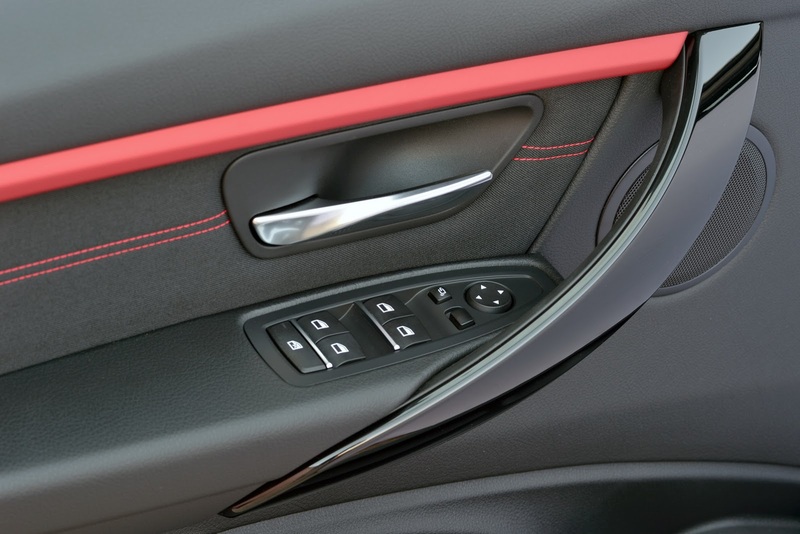 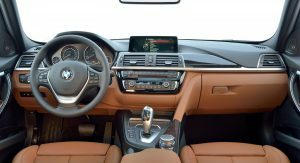 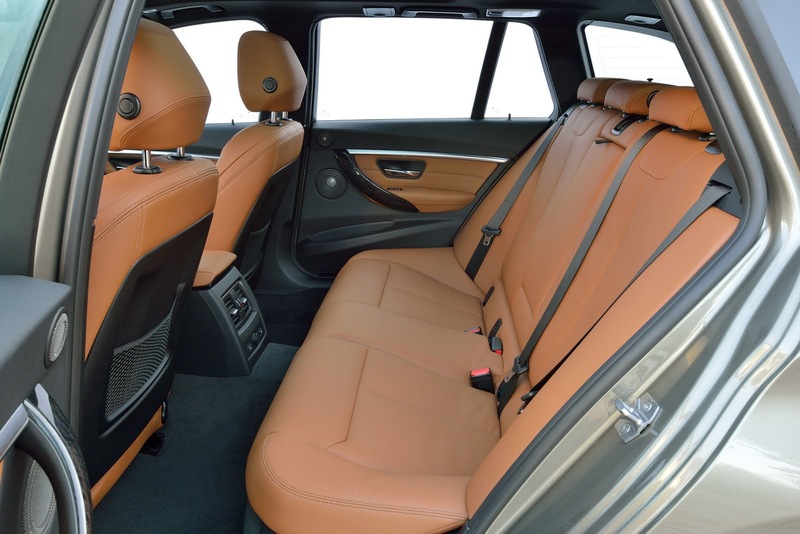 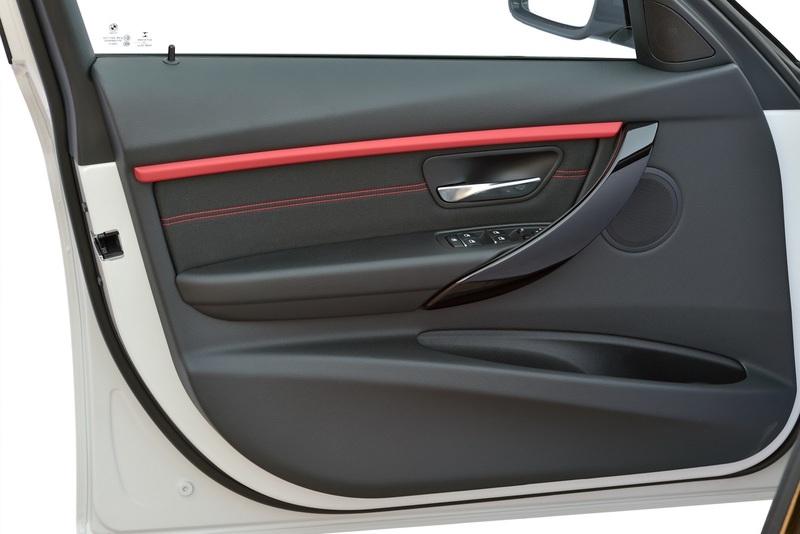 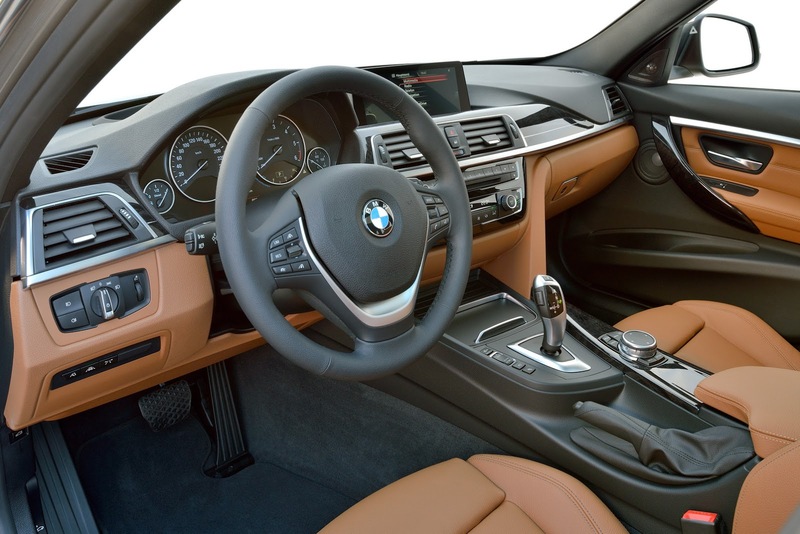 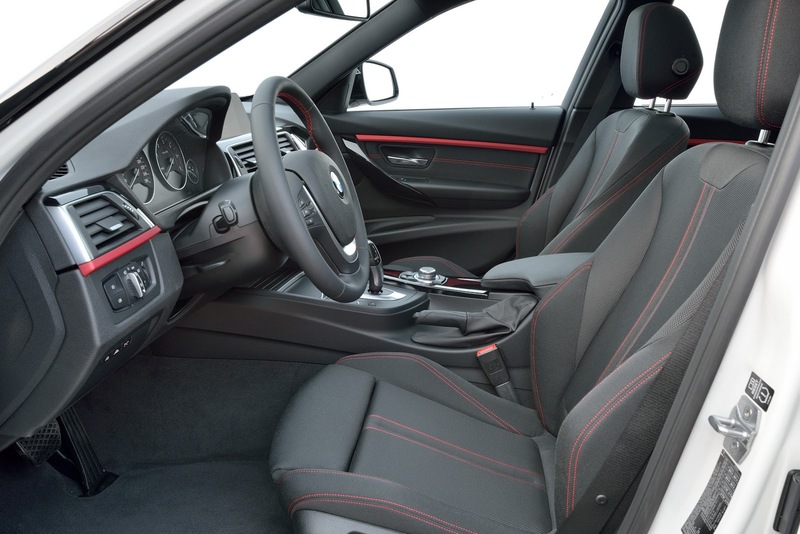 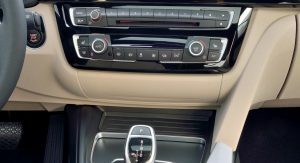 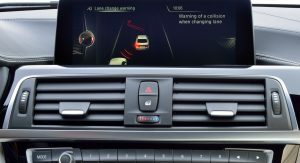 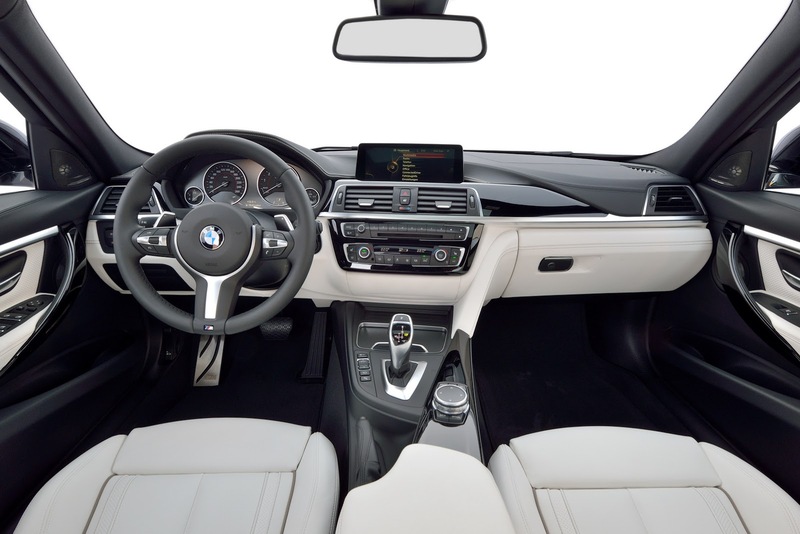 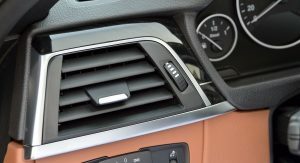 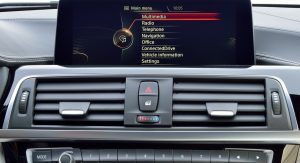 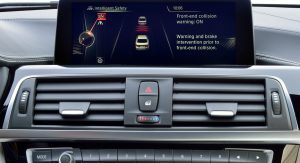 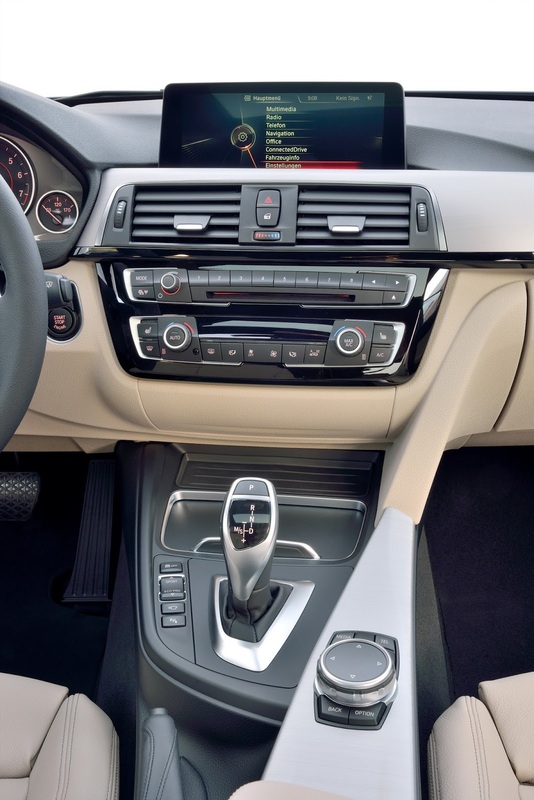 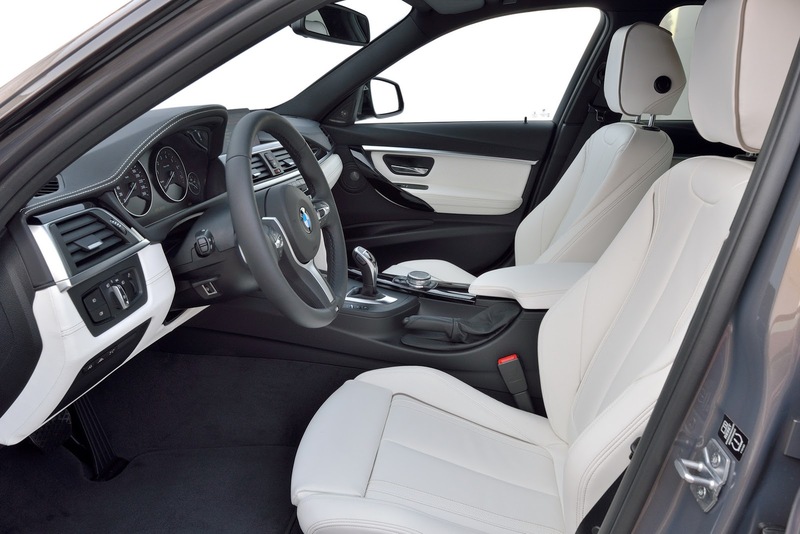 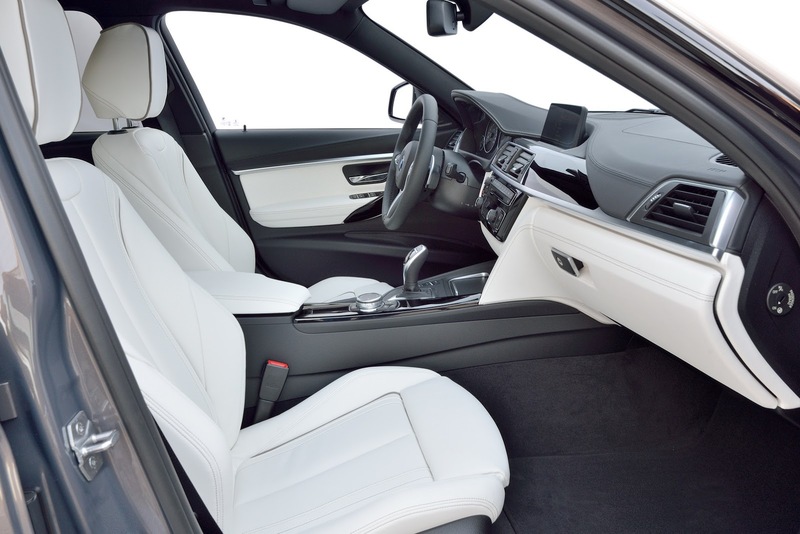 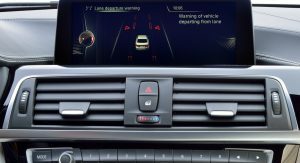 Inside, along with the updated iDrive infotainment system that gets new features, BMW added high-gloss black splashes on the center console, more ambient lighting and expanded chrome accents. 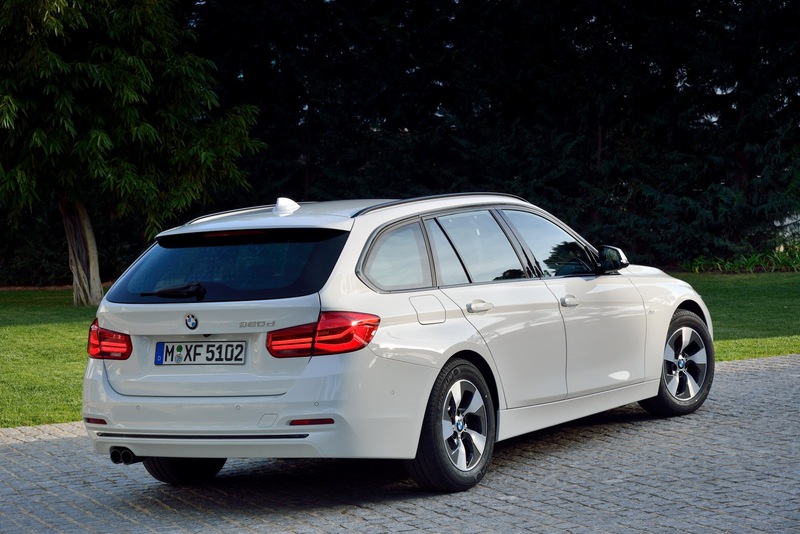 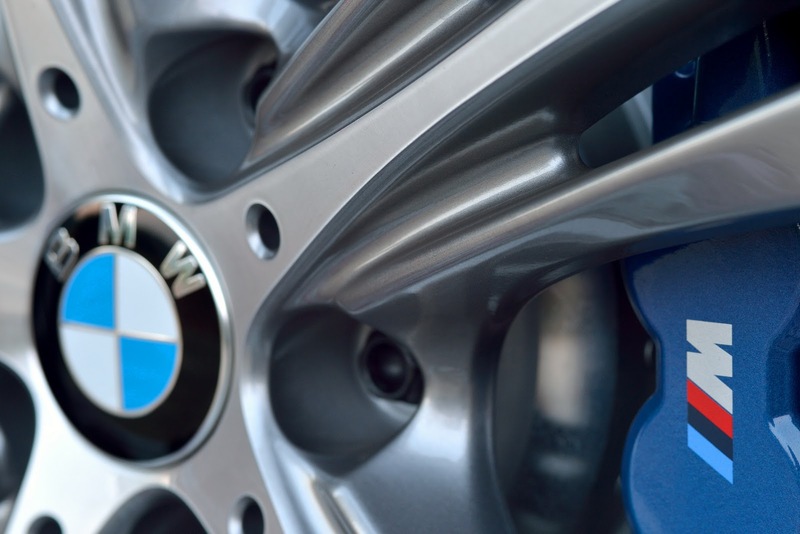 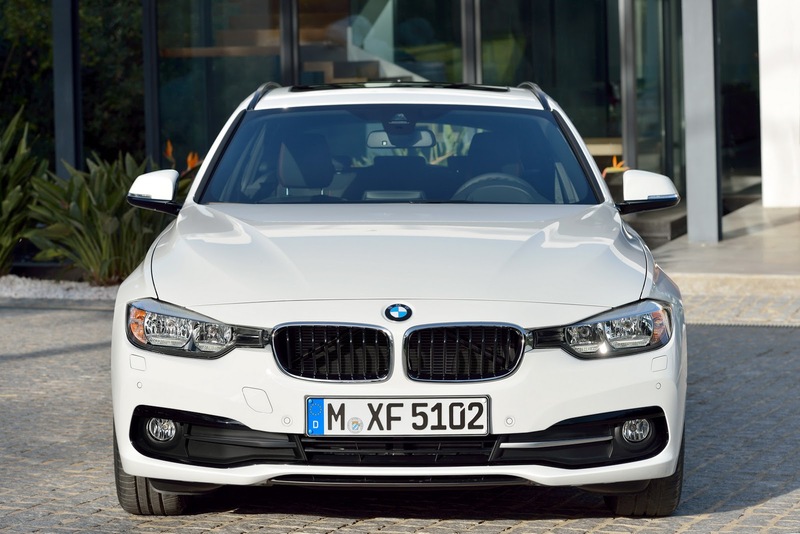 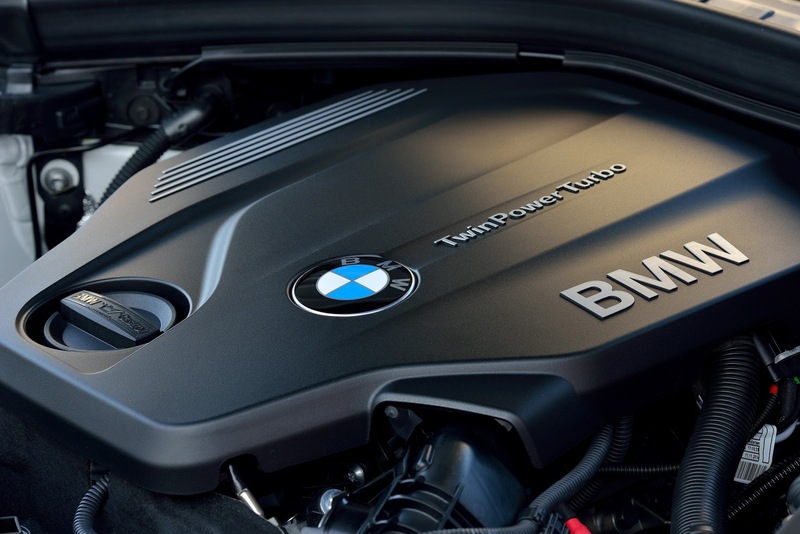 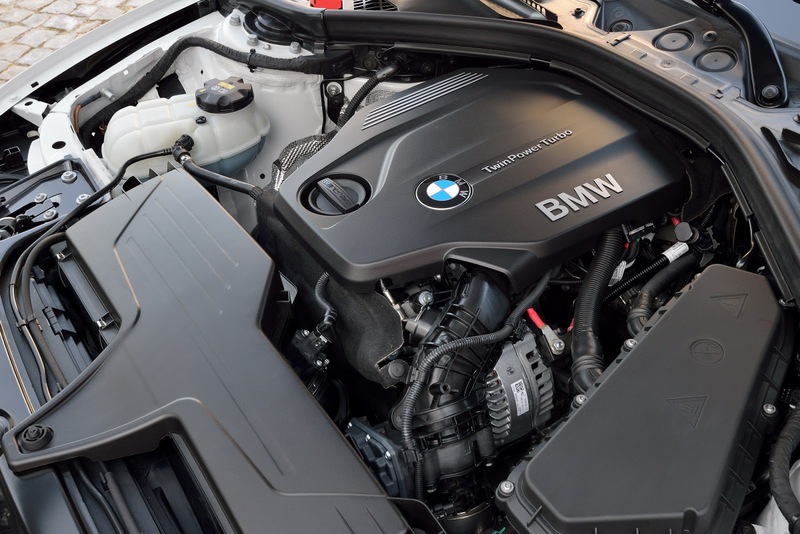 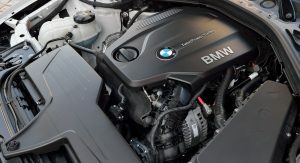 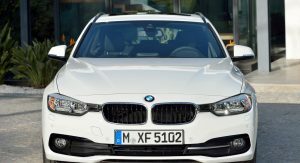 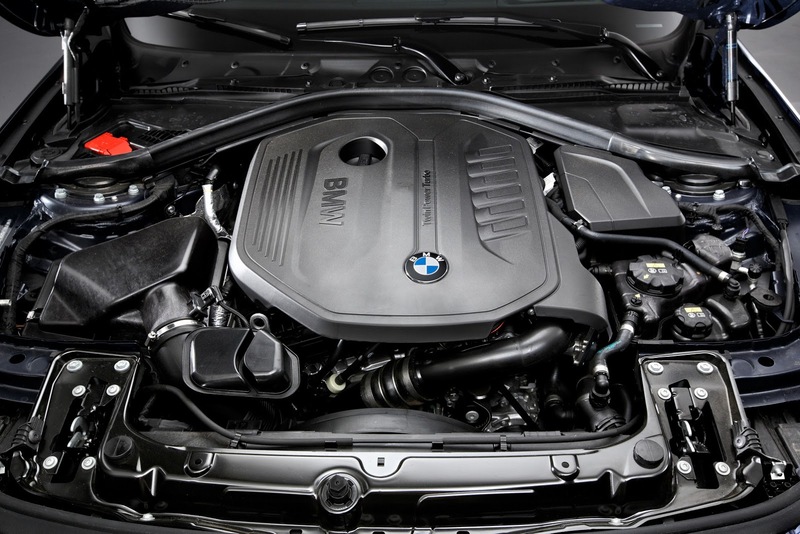 Whereas Europe will get BMW’s new 1.5-liter turbo 3-cylinder gasoline unit, North America (N.A.) 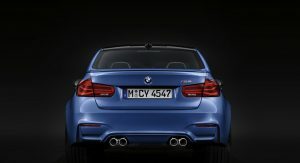 will stick to inline four and six cylinder units. 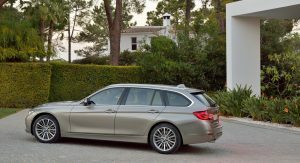 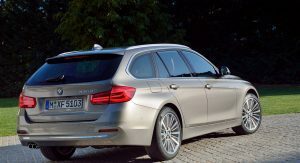 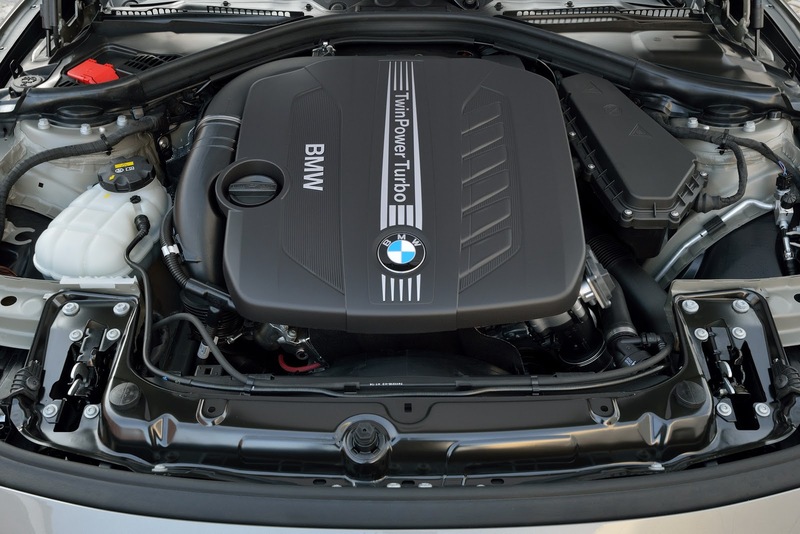 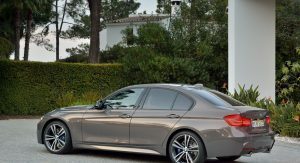 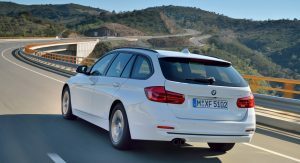 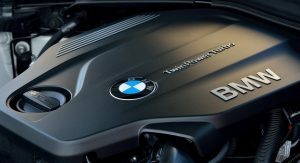 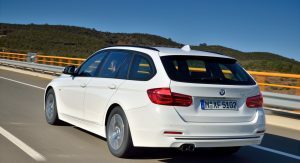 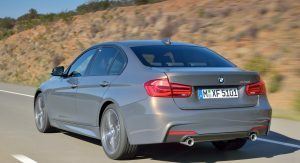 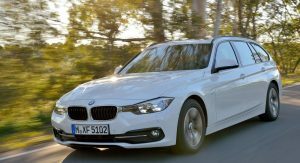 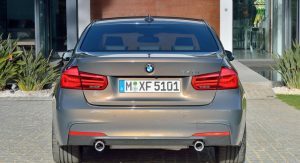 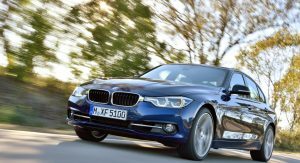 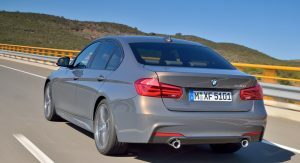 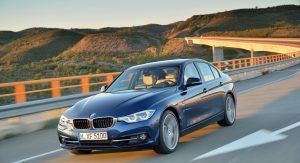 Surprisingly, while Europe gets an uprated 249hp (252PS) 2.0-liter turbocharged four gasoline for the 328i that becomes the 330i over there, BMW kept the current N20 2.0-liter turbocharged gasoline fours for the 320i and 328i in N.A. 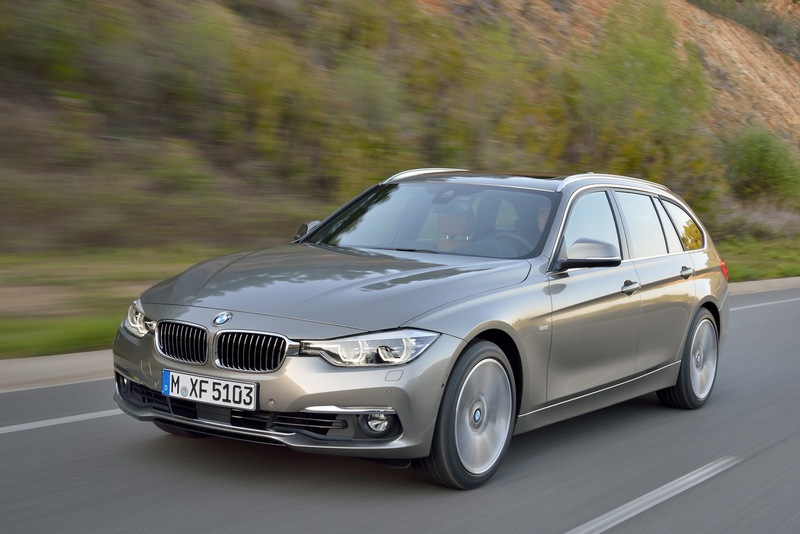 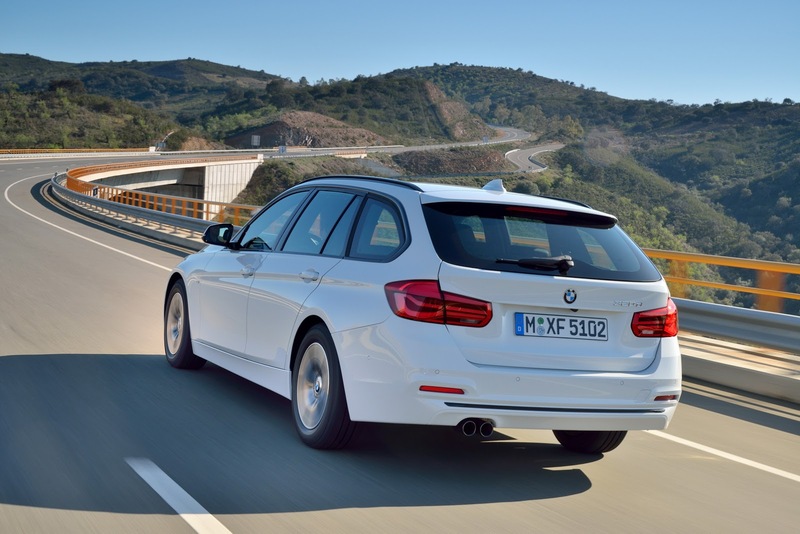 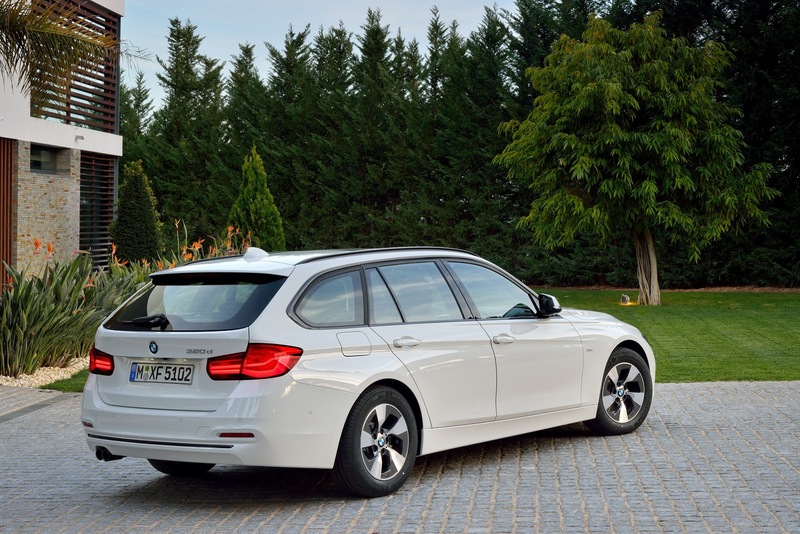 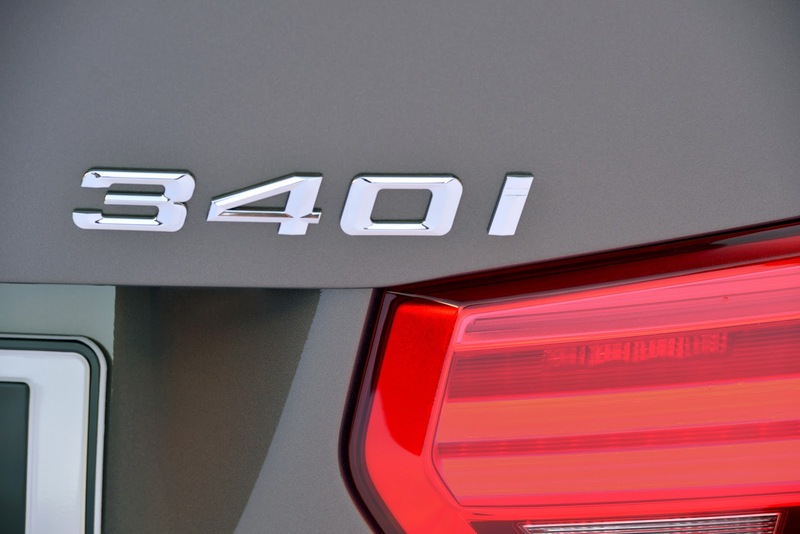 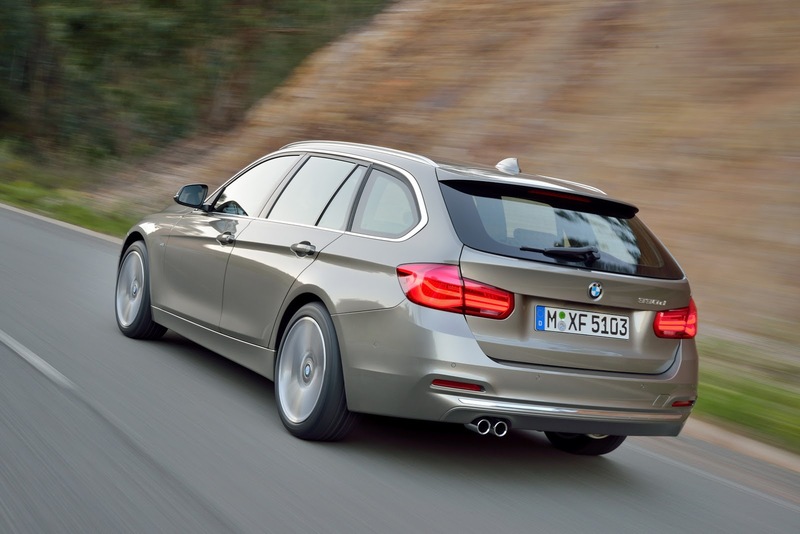 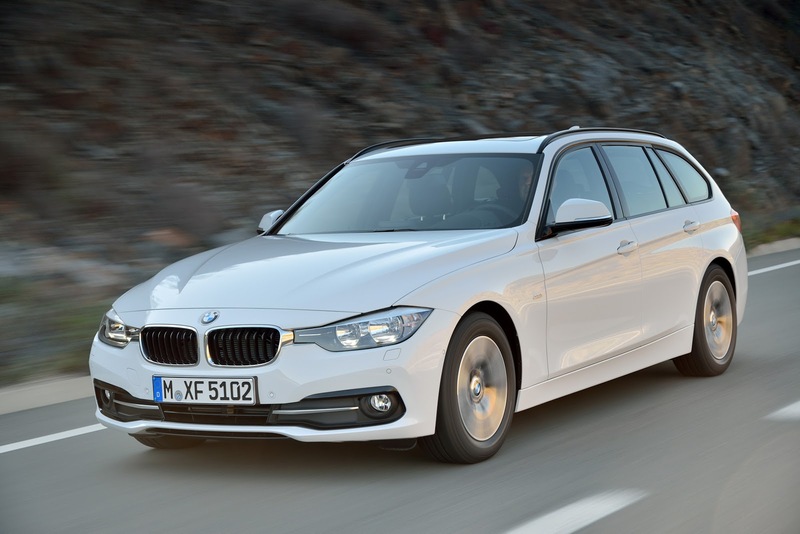 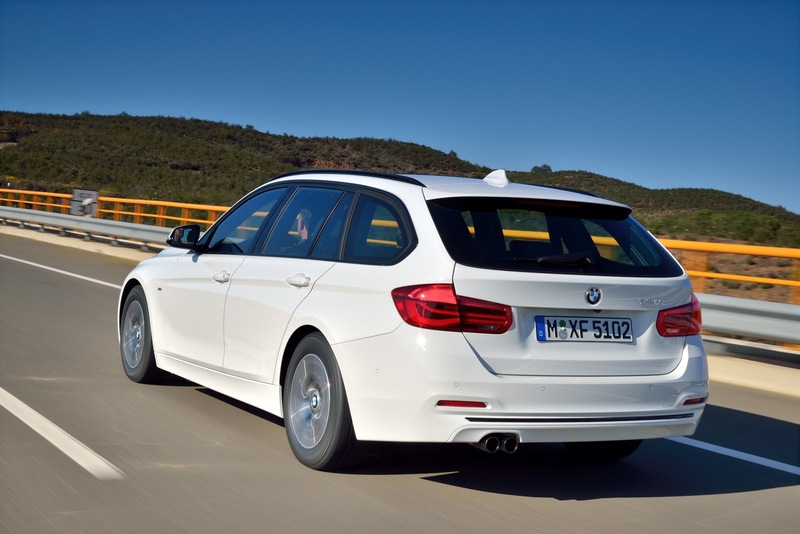 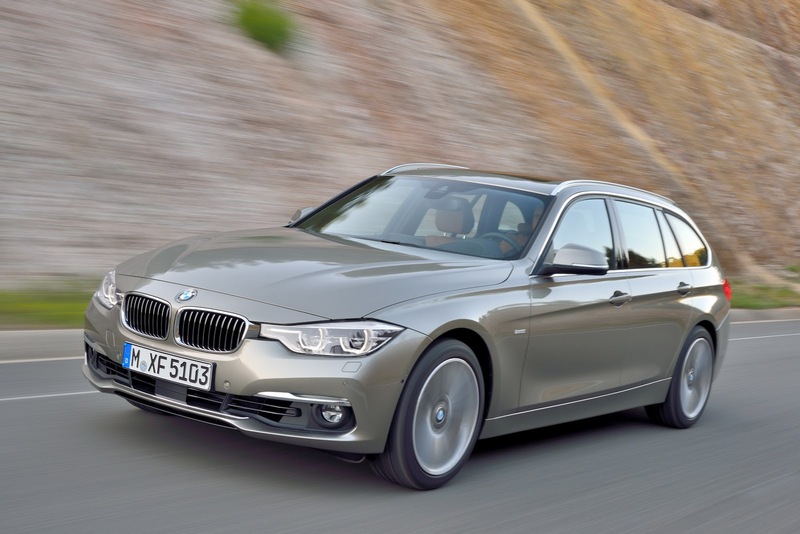 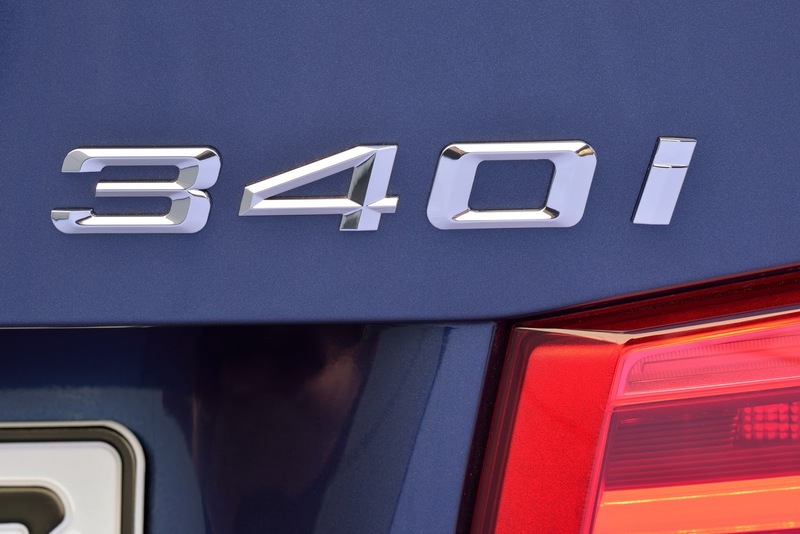 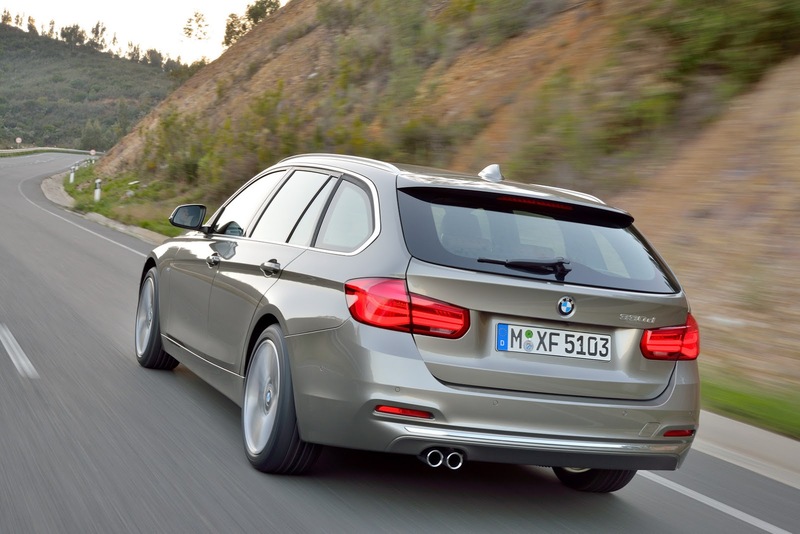 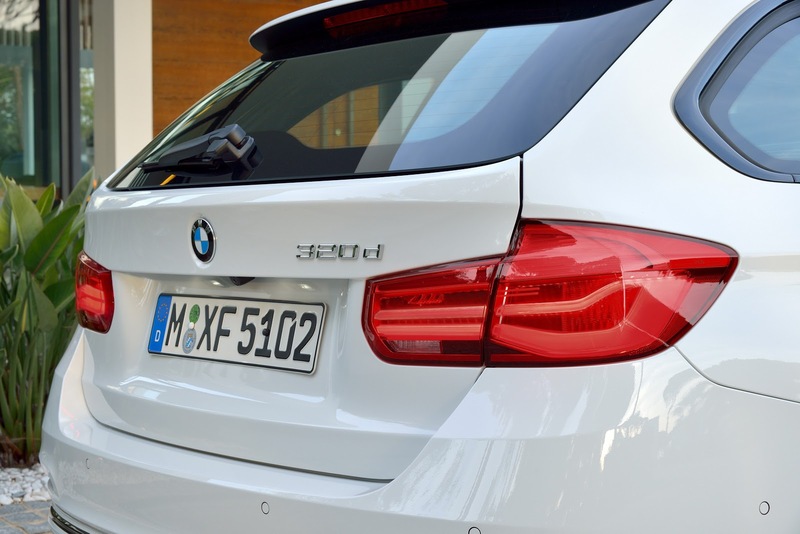 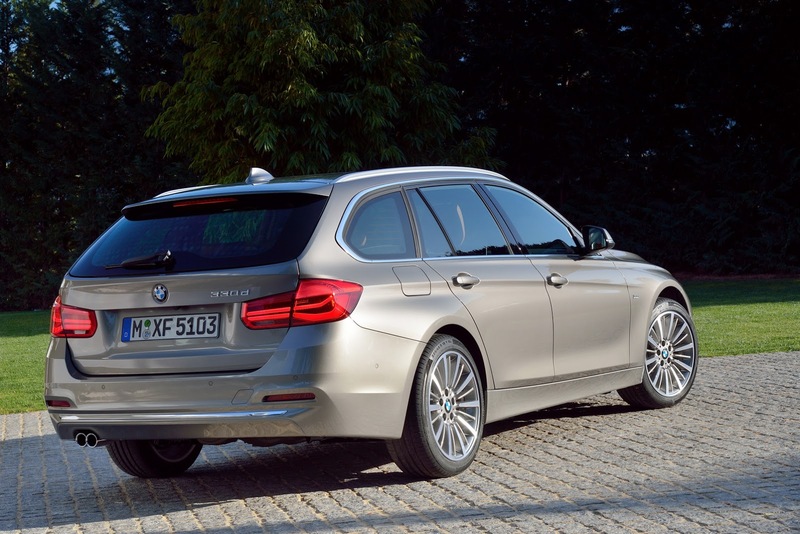 The 328d with a 2.0-liter turbo diesel also remains. 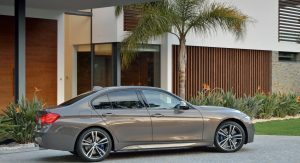 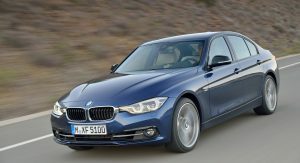 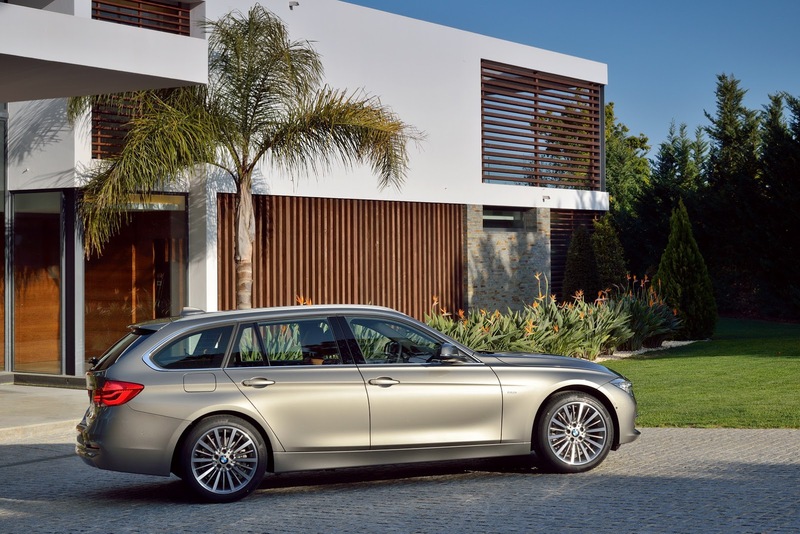 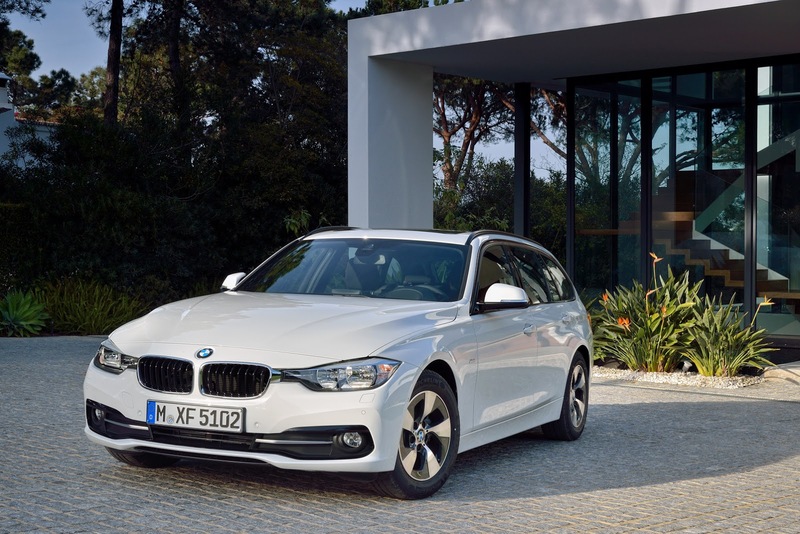 What’s new for North America is the 340i that obtains BMW’s newer B58 3.0-liter turbocharged six with 320hp and 330 lb-ft that replaces the 335i and its N55 3.0-liter turbo with 300hp and 300 lb-ft. BMW quotes 0-60mph times of 4.8 seconds for the RWD 340i and 4.6 seconds for the 340i xDrive making them 0.3 and 0.2 seconds faster than their corresponding 335i siblings. 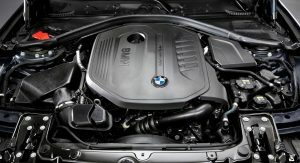 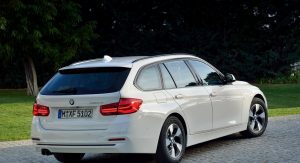 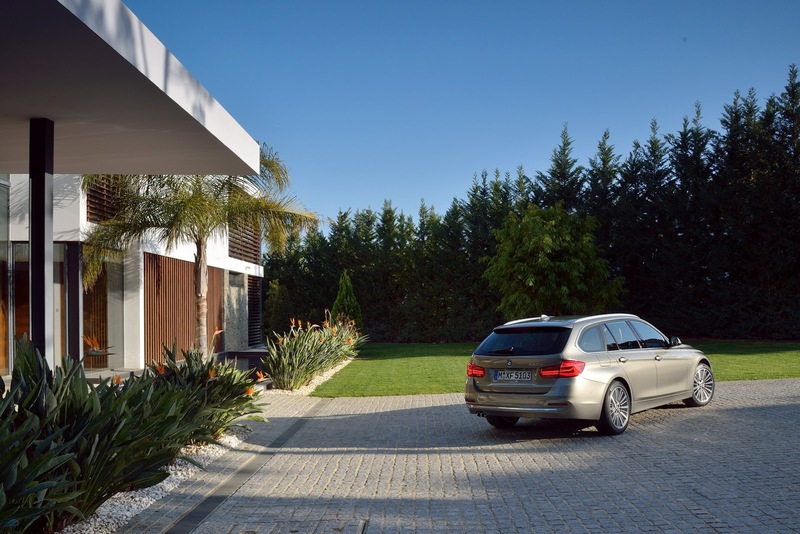 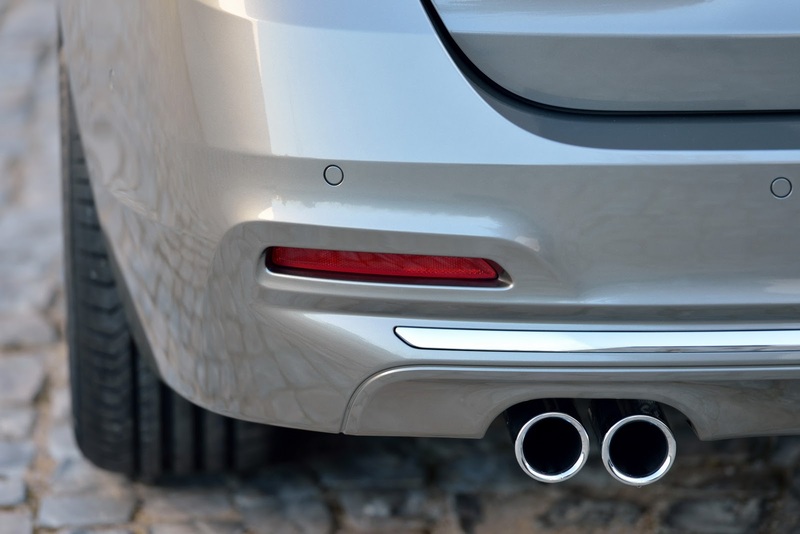 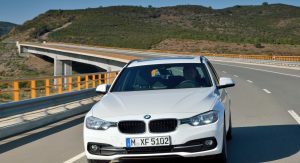 All engines can be had with rear- or all-wheel drive (xDrive) and an updated 8-speed Steptronic automatic transmission, with the RWD 320i, 328i, 340i and the all-wheel drive 340i xDrive also being available with a no-cost option 6-speed manual gearbox. 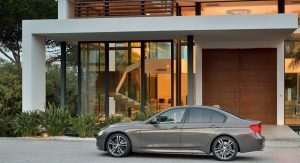 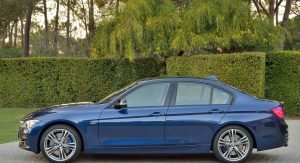 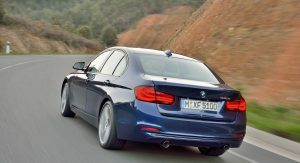 The 340i gets a different six-speed manual equipped with a dual-mass flywheel with centrifugal pendulum absorbers that “counteracts uneven running on high-torque engines so that the driver can change gears smoothly” and a rev matching function. 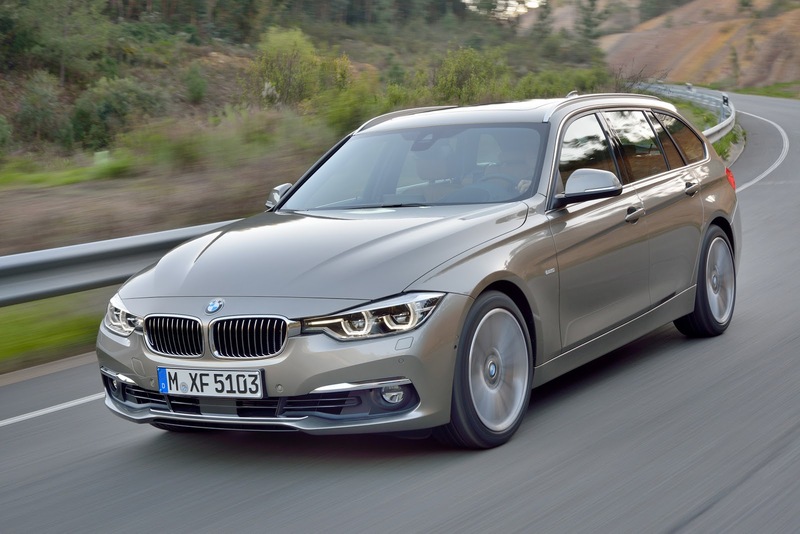 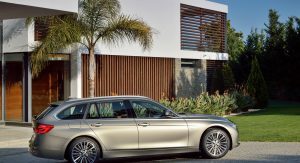 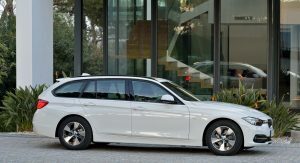 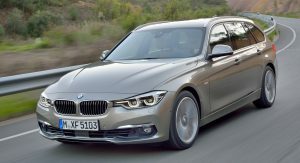 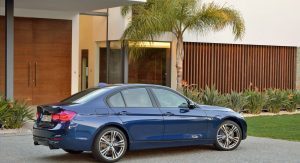 Also new for North America is the 330e plug-in hybrid that pairs a 2.0-liter turbocharged four gasoline engine to electric motor and an 8-speed Steptronic transmission producing a combined output of 250 hp and 310 lb-ft. 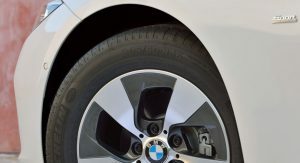 It accelerates to 60mph (96km/h) in 6.1 seconds, tops out at 140 mph (225 km/h) and can travel on pure battery power for up to 22 miles (35 kilometers). 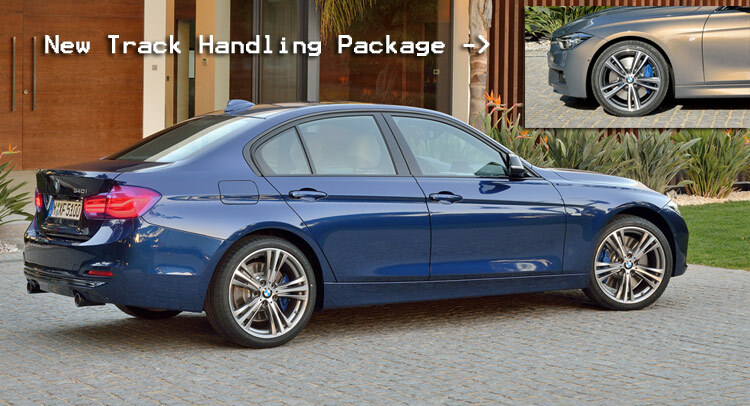 Moving on to the equipment trims and kit, the first thing that caught our eye is the addition of a new optional Track Handling package (similar to the one on the 228i) offered on all gasoline models. 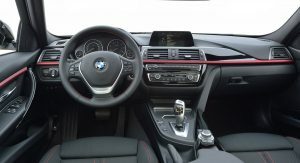 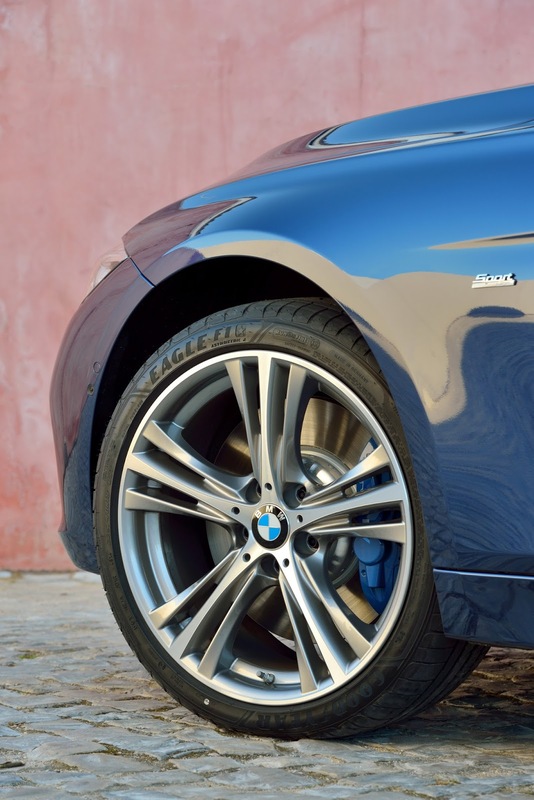 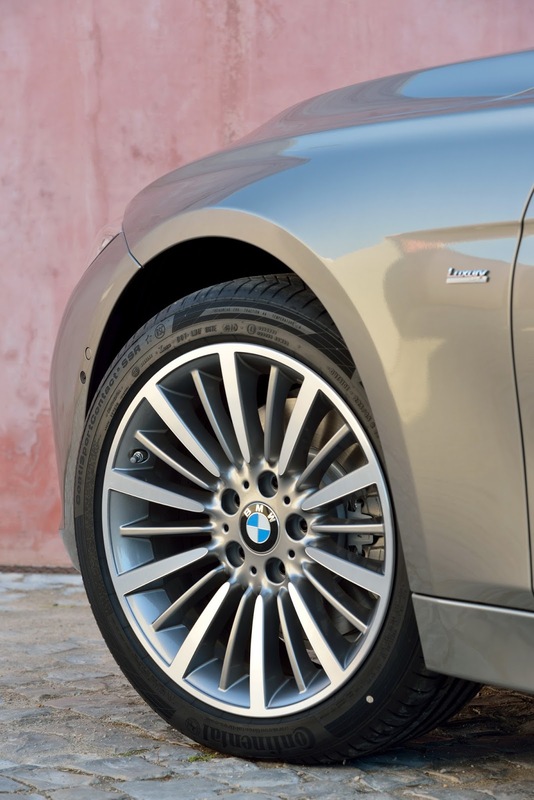 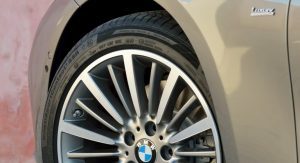 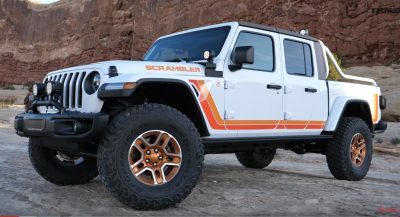 It consists of Variable Sport Steering, Adaptive M Suspension, M Sport Brakes with high temperature Euro brake pads mounted to blue calipers, and 18-inch alloys in Orbit Grey with Michelin Super Sport tires or optionally, 19-inch on the 340i. 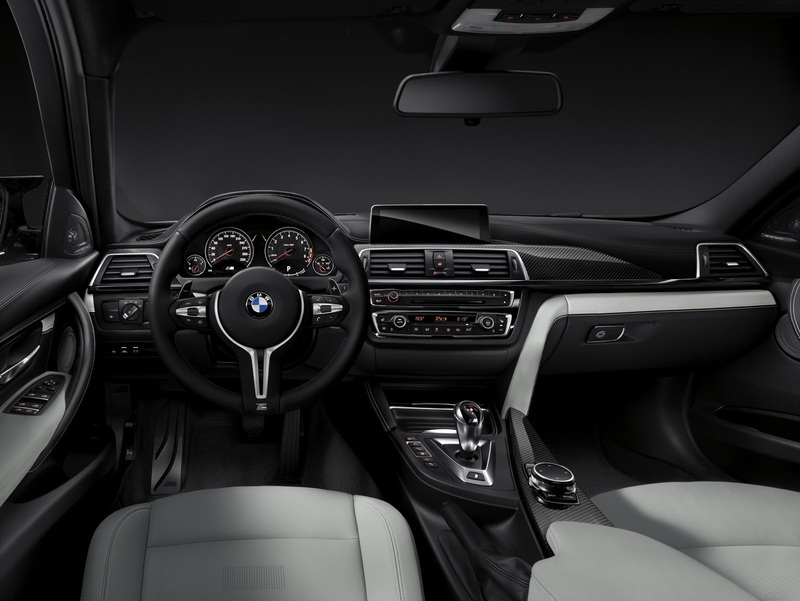 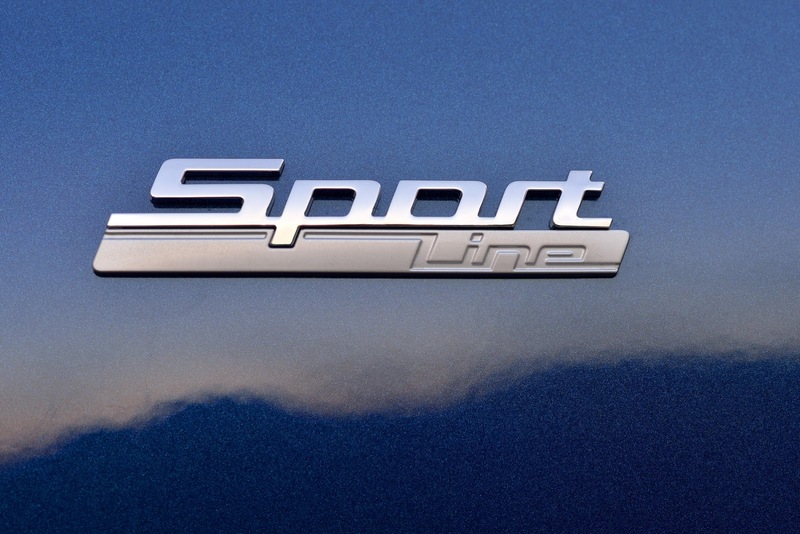 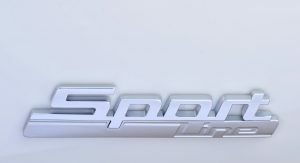 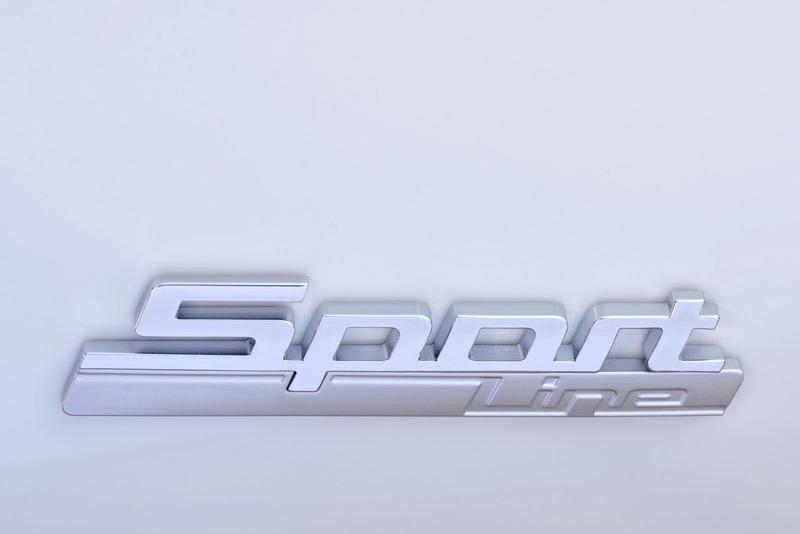 The previously optional Sport Line now becomes standard on the 328i, 328d and 340i models (including the xDrive variations) featuring high-gloss black exterior trim, sport instrument cluster and seats with side bolsters. 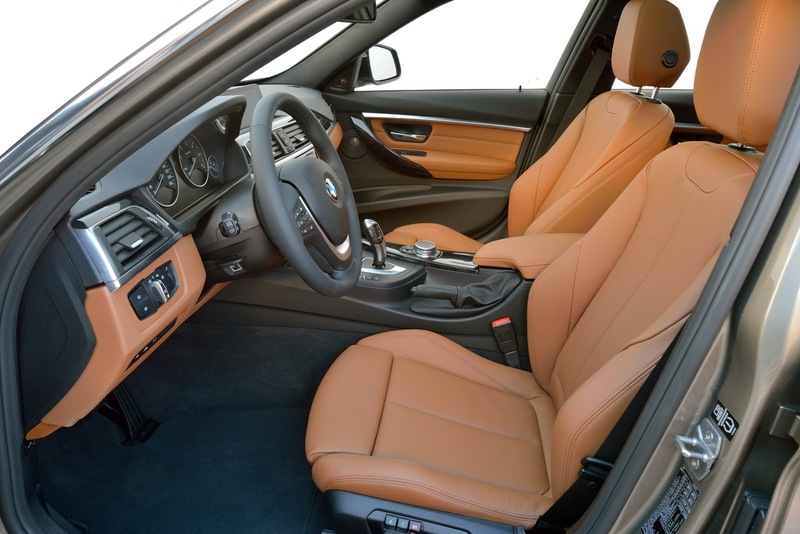 Furthermore, the Sport Line can now be had with Saddle Brown Dakota Leather with dark brown highlights (previously offered only on the Luxury Line). 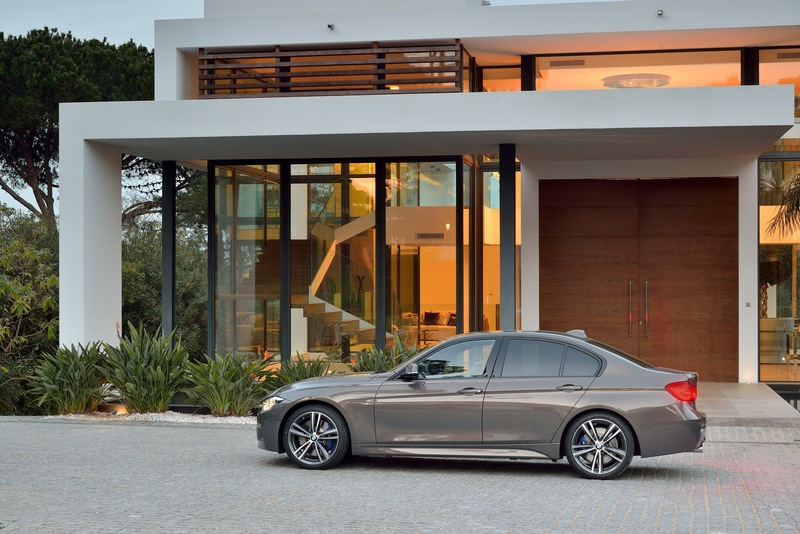 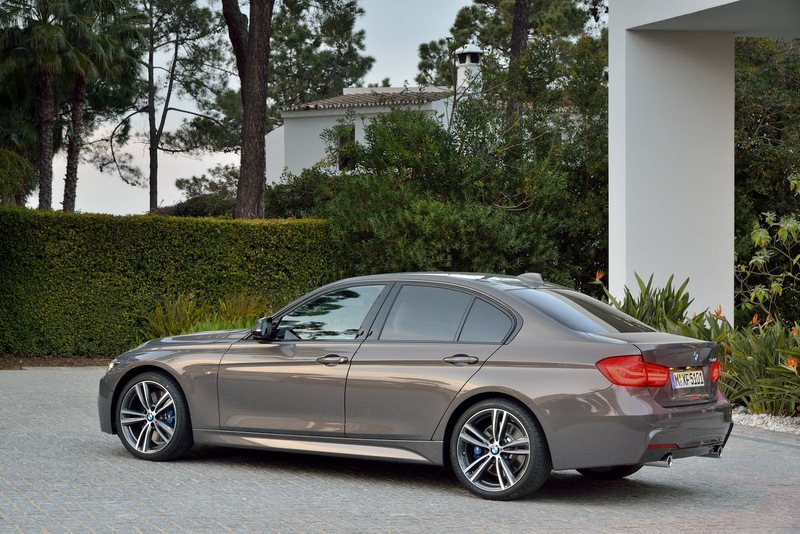 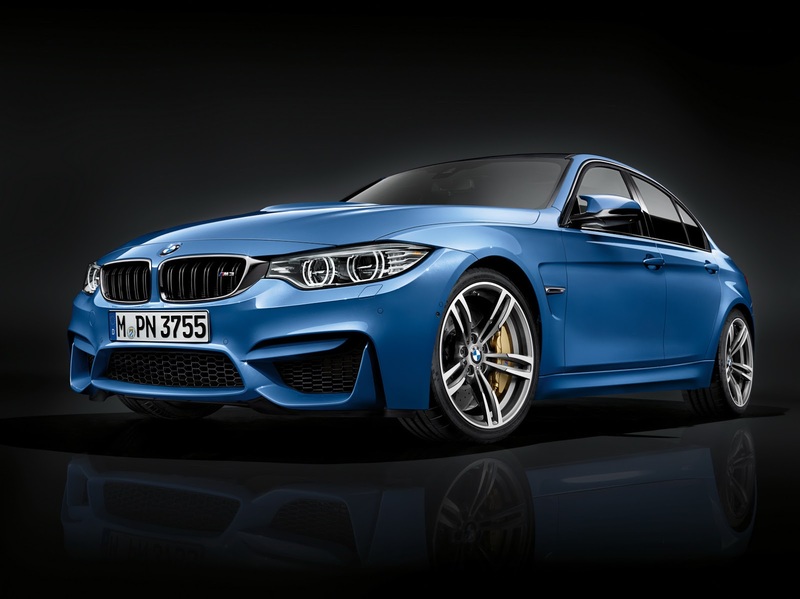 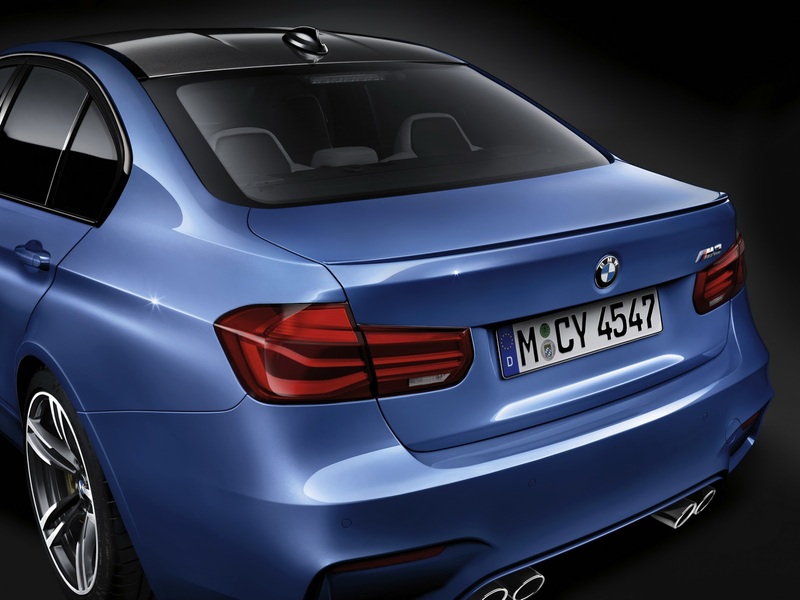 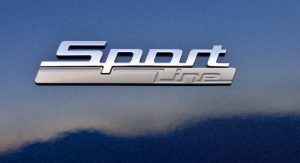 The Luxury and M Sport lines continue for the 2016MY unchanged. 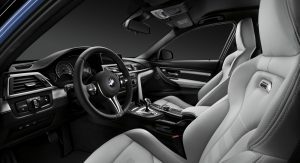 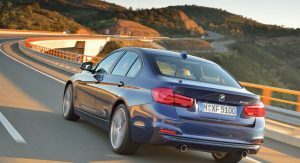 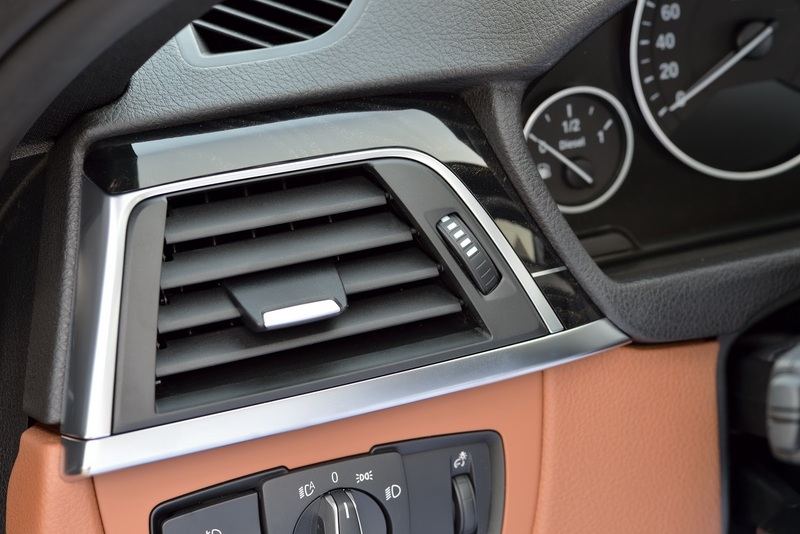 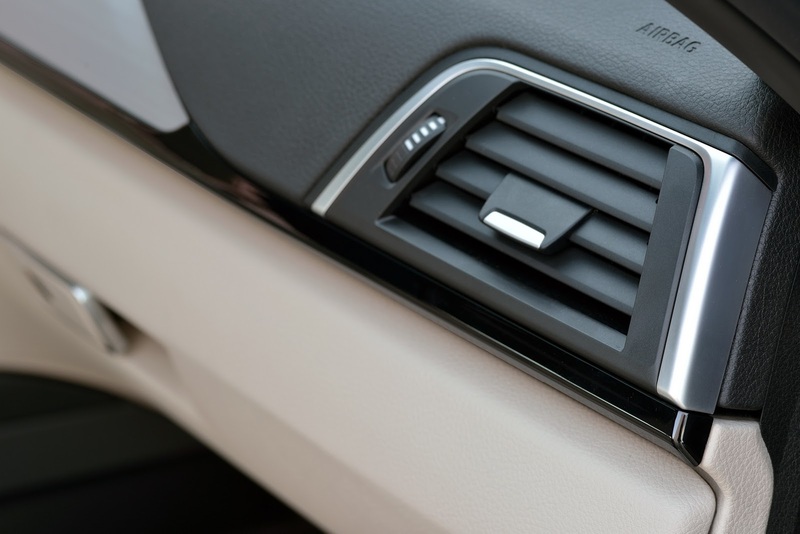 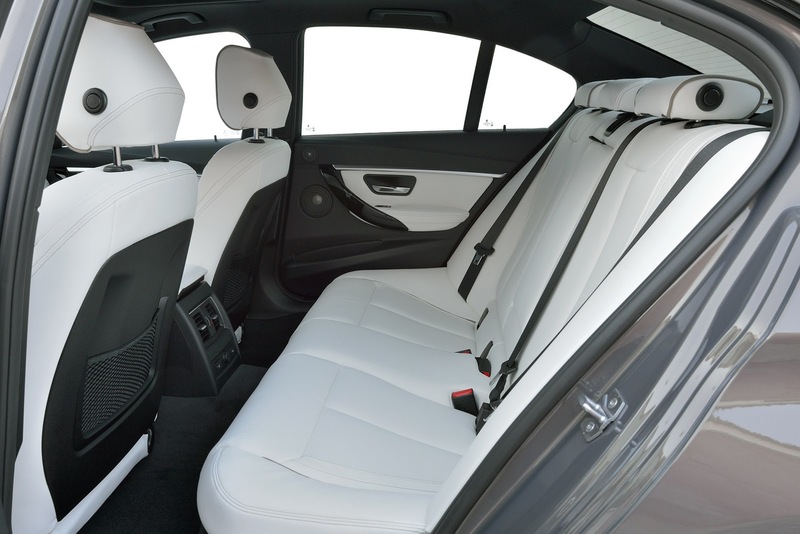 The newly improved optional Premium Package for the 328i and 328d models (standard for the 340i) includes Comfort Access, LED Headlights, Lumbar Support, Moonroof and Sirius Satellite radio with a no-cost one-year subscription. 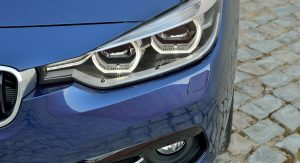 Finally, North America gets three new exterior color choices, the Mediterranean Blue Metallic, Platinum Silver Metallic and Jatoba Brown Metallic. 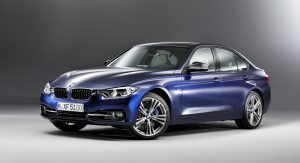 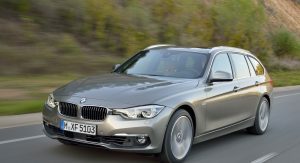 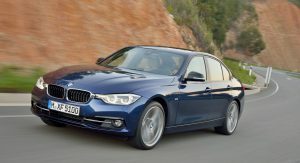 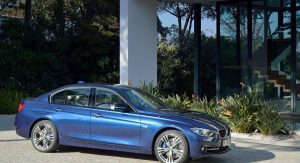 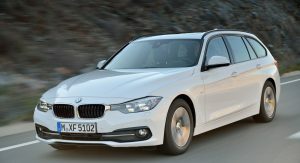 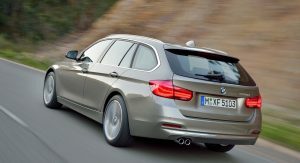 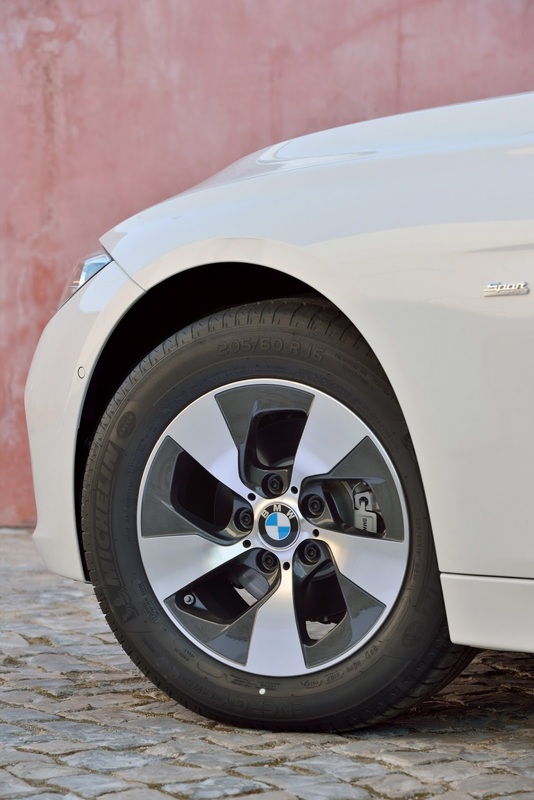 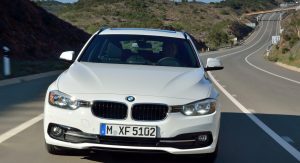 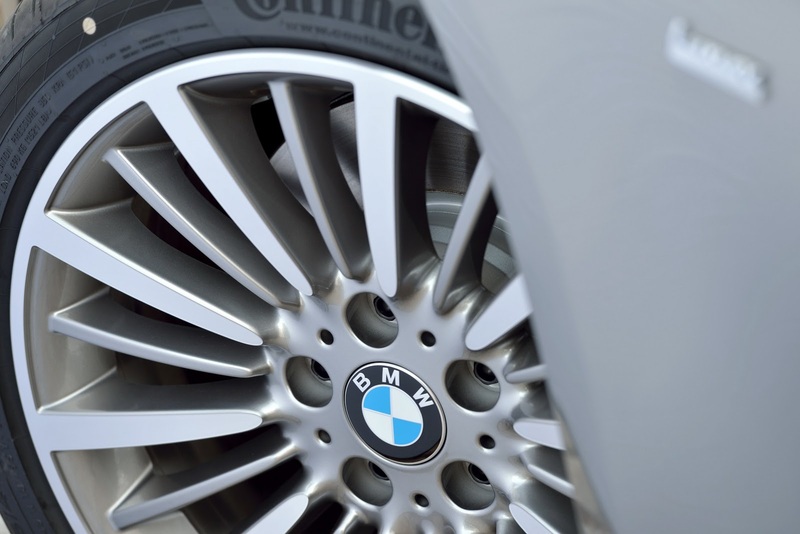 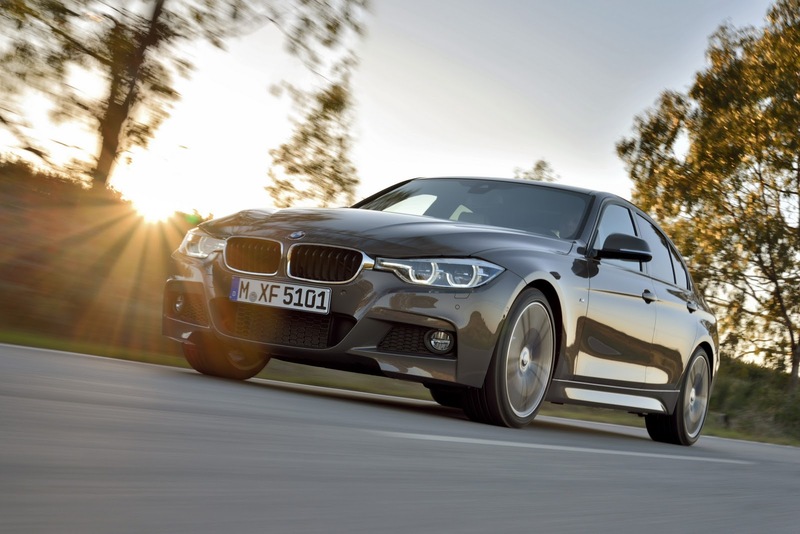 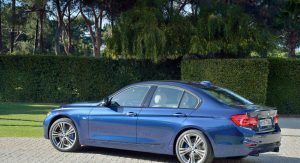 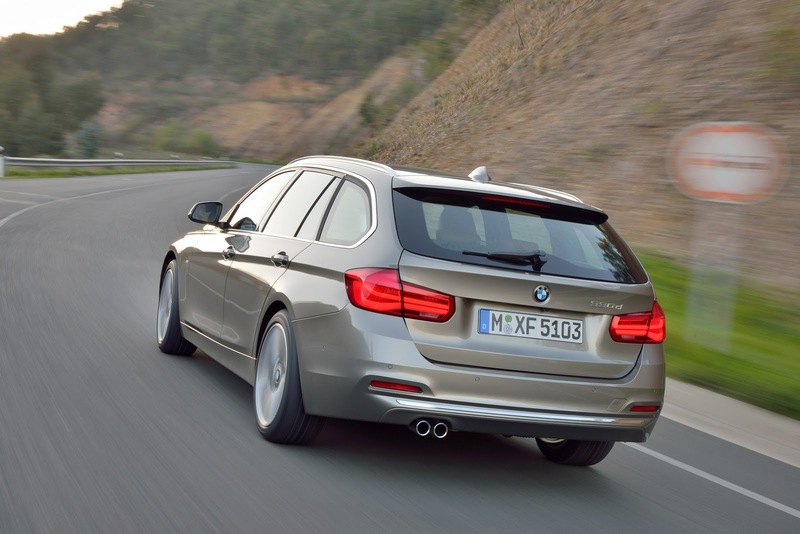 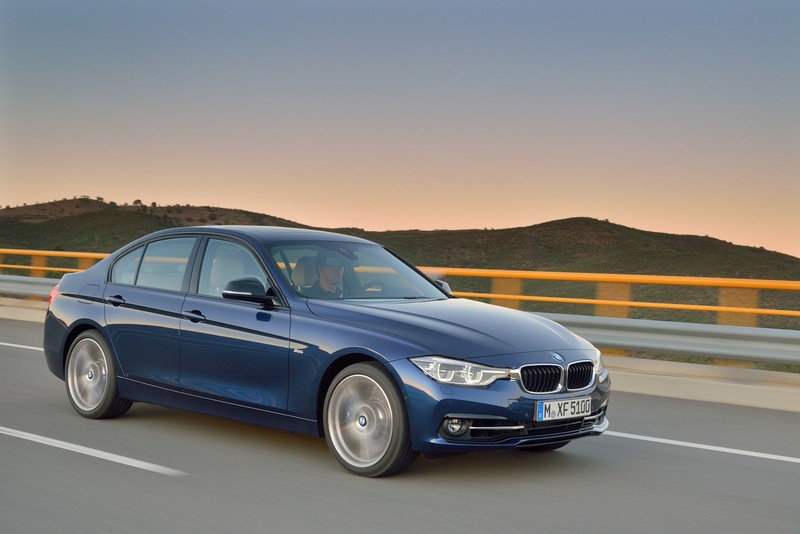 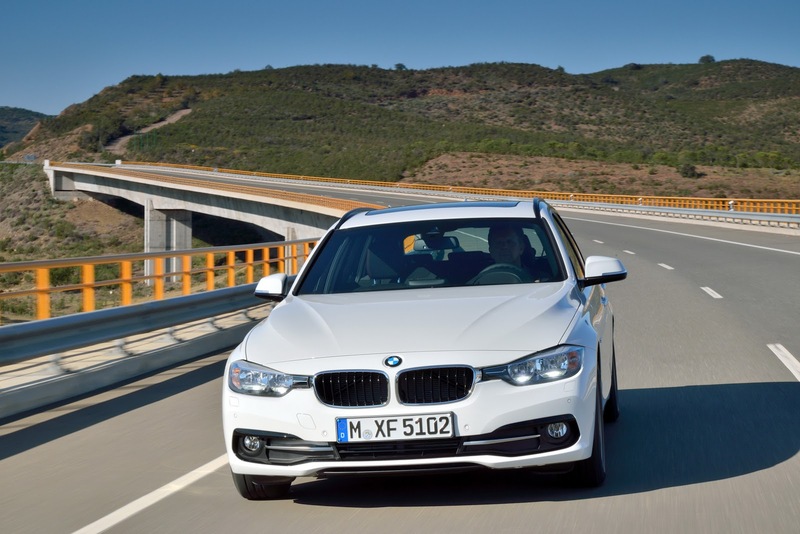 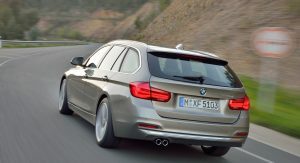 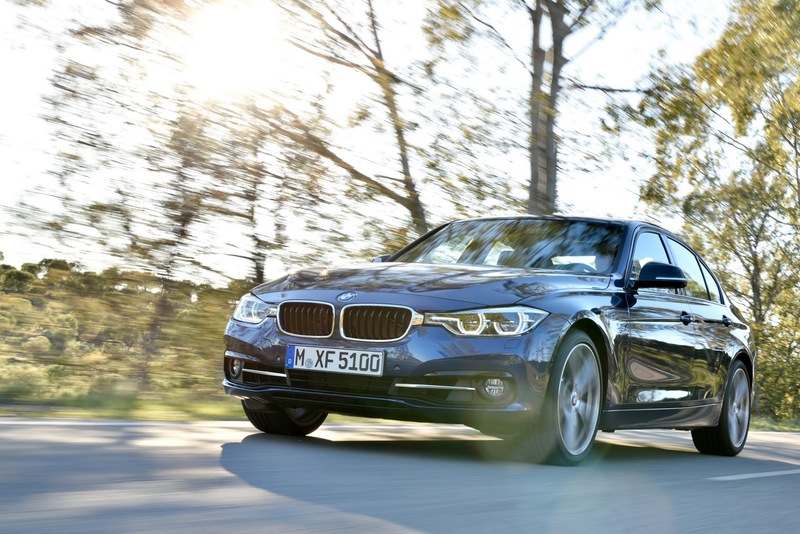 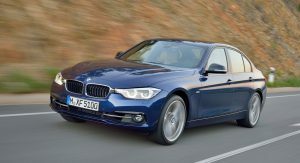 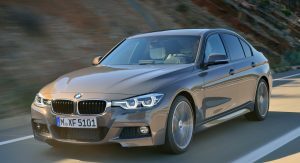 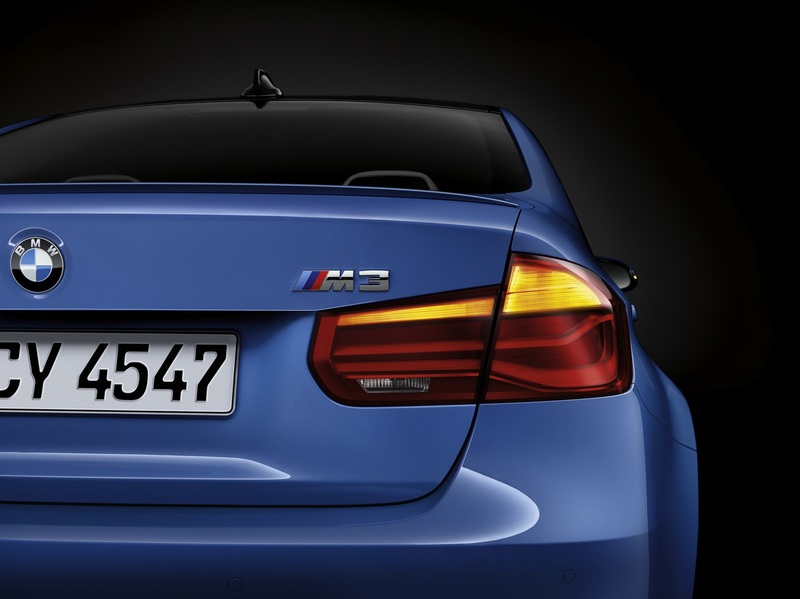 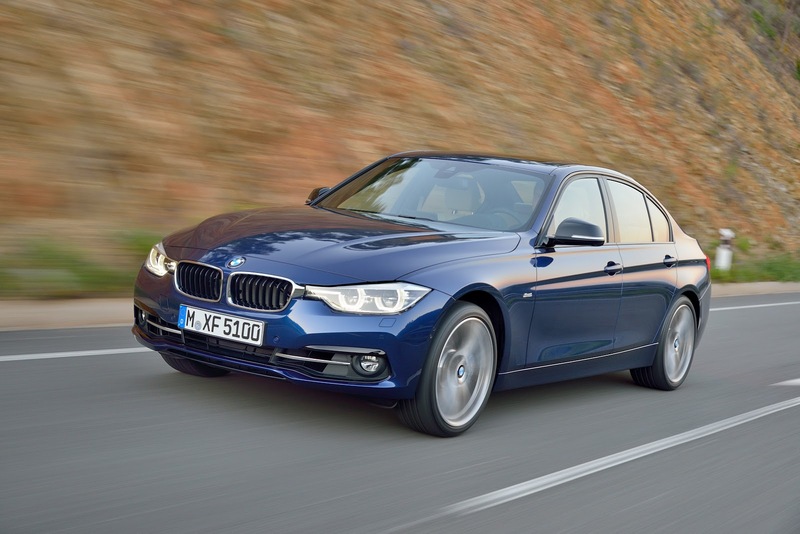 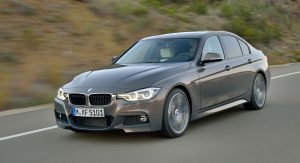 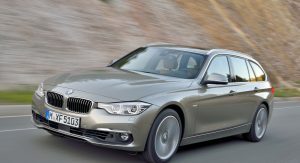 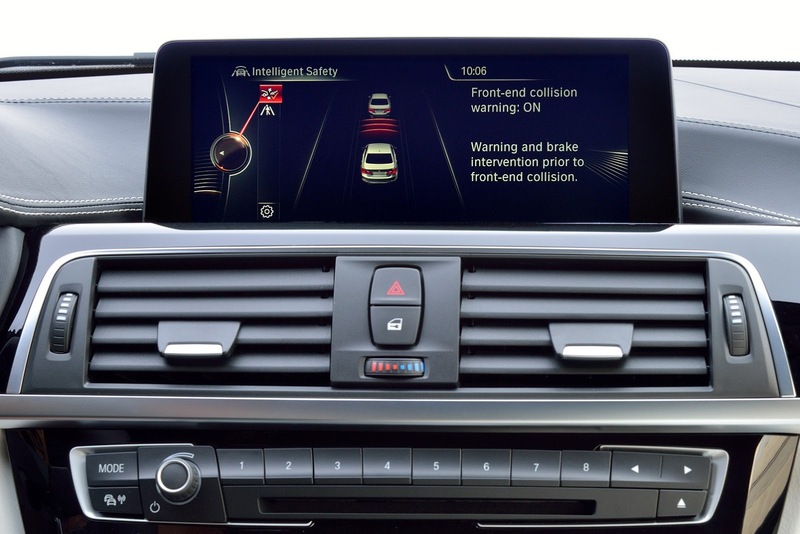 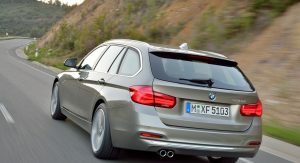 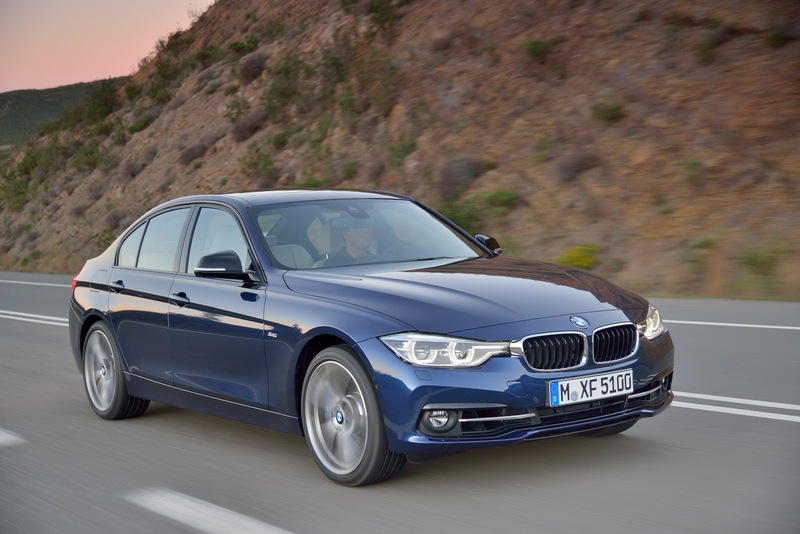 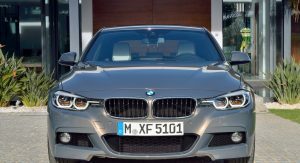 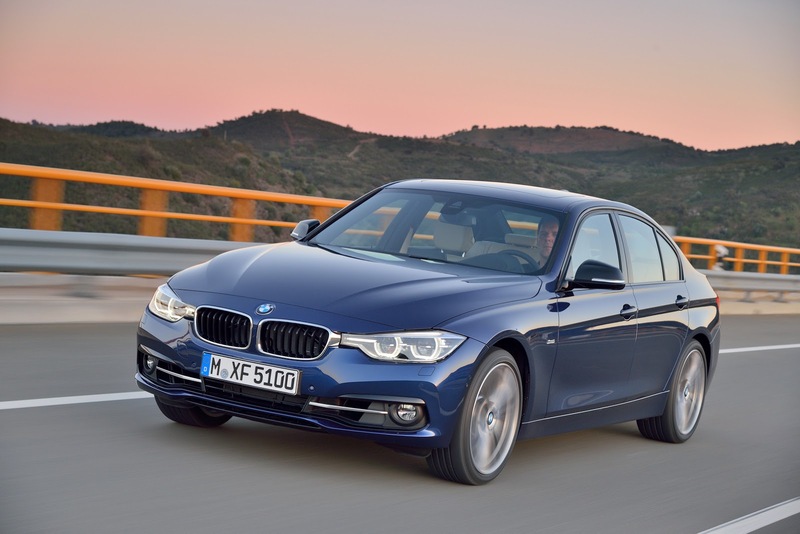 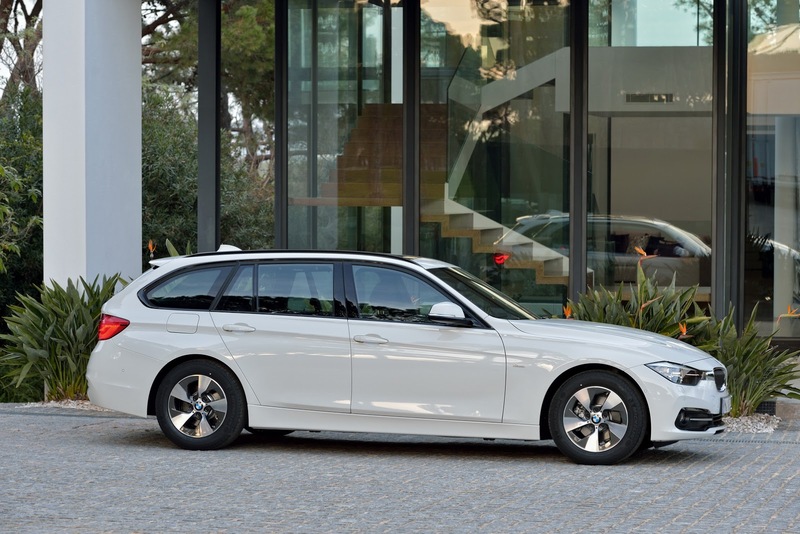 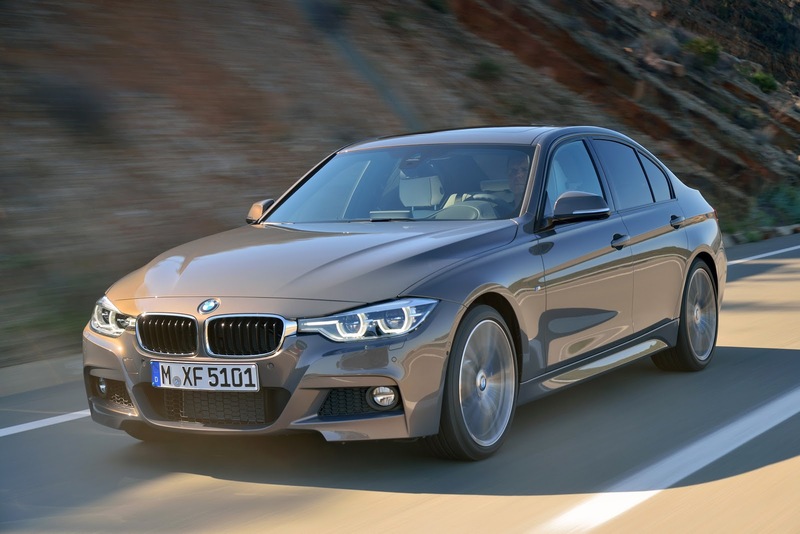 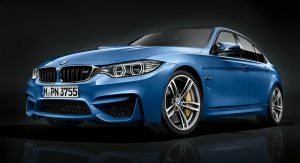 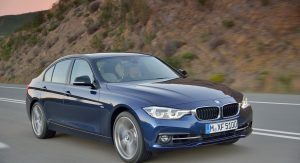 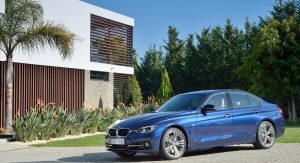 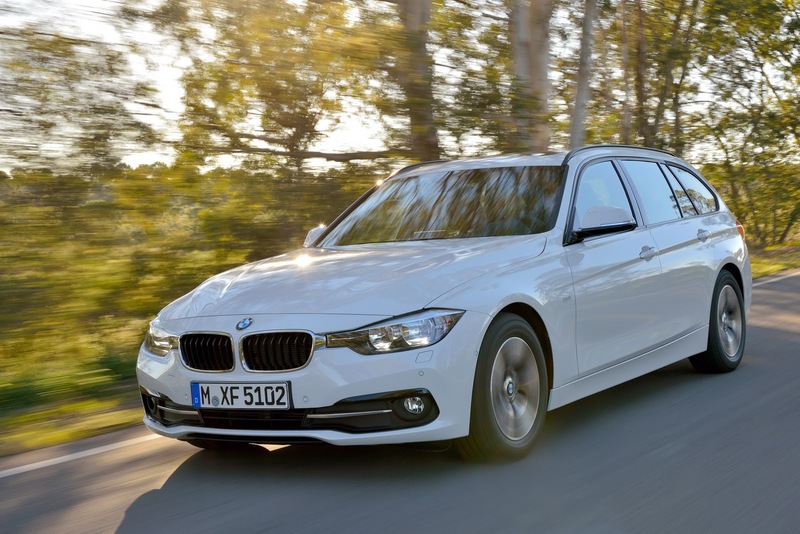 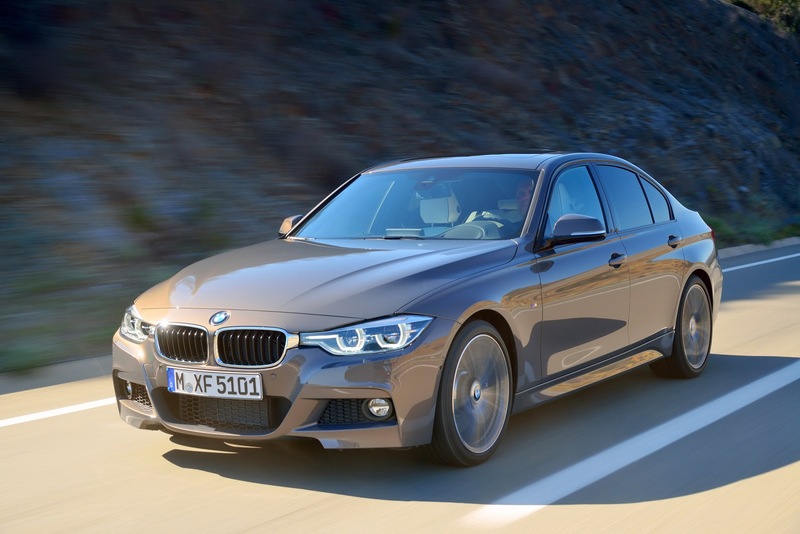 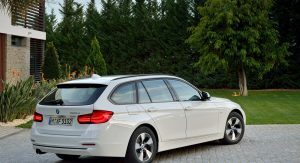 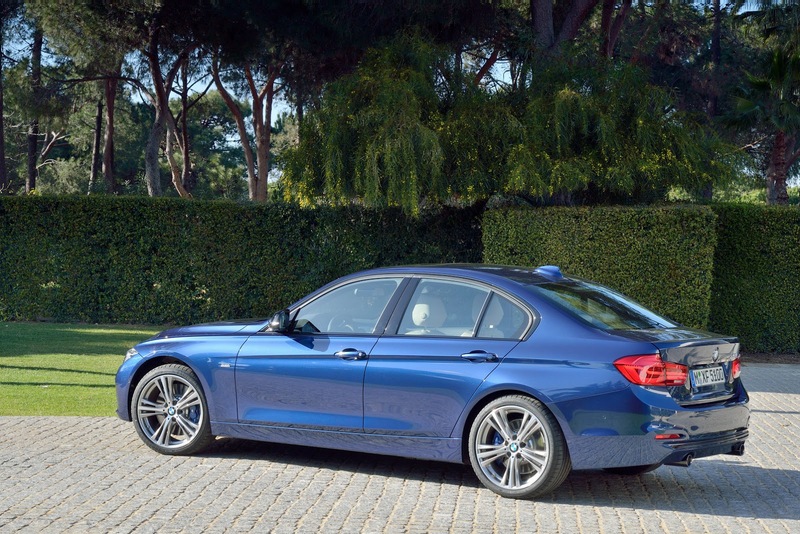 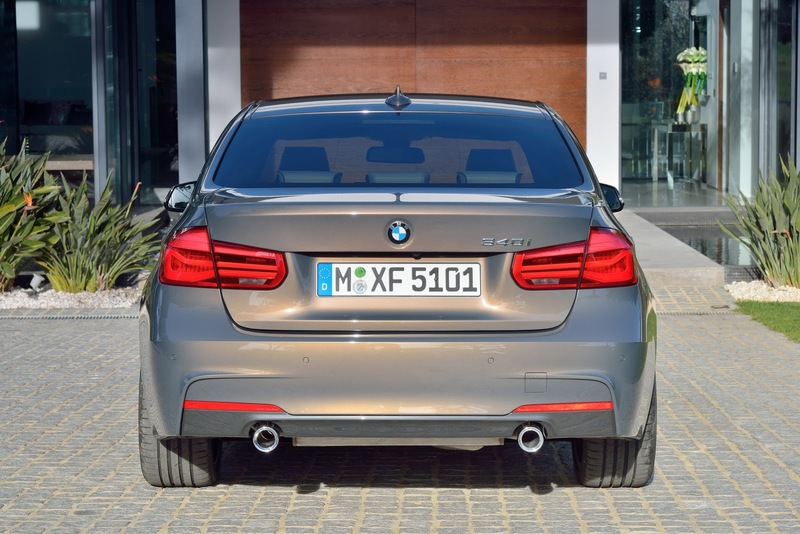 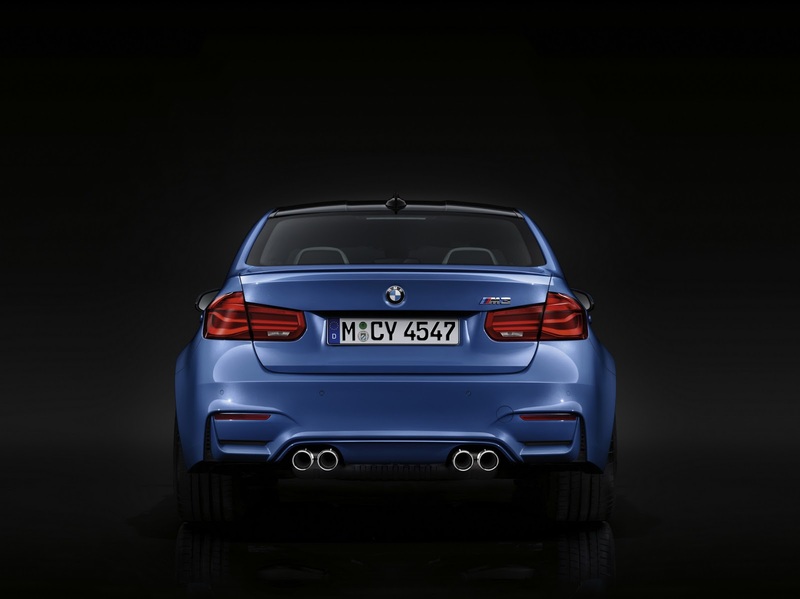 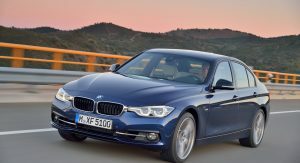 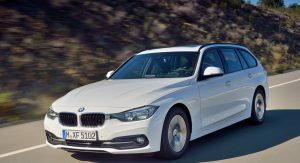 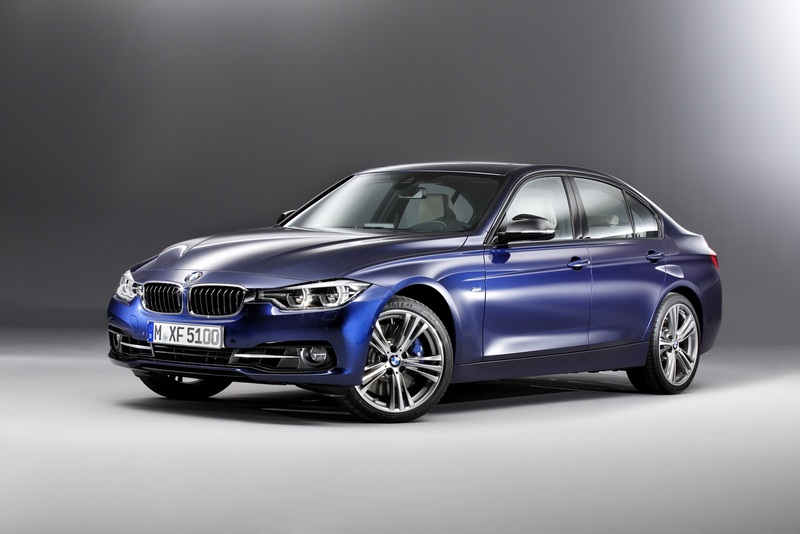 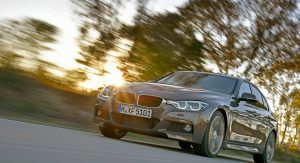 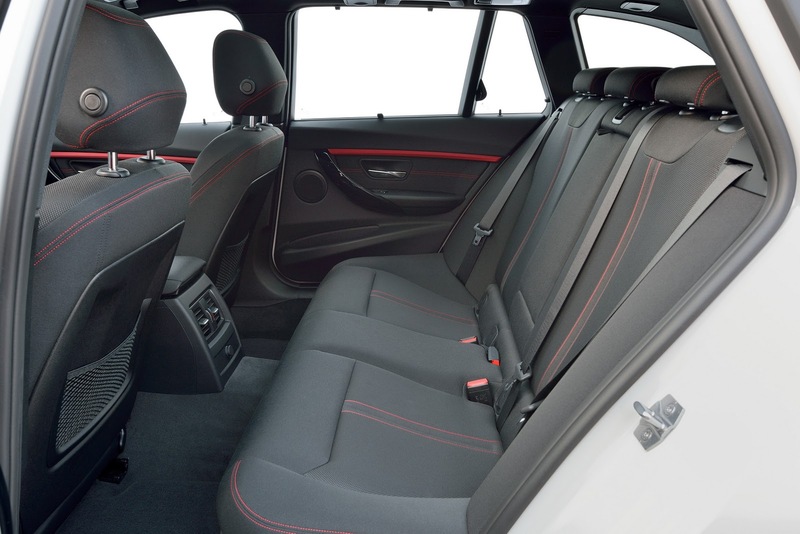 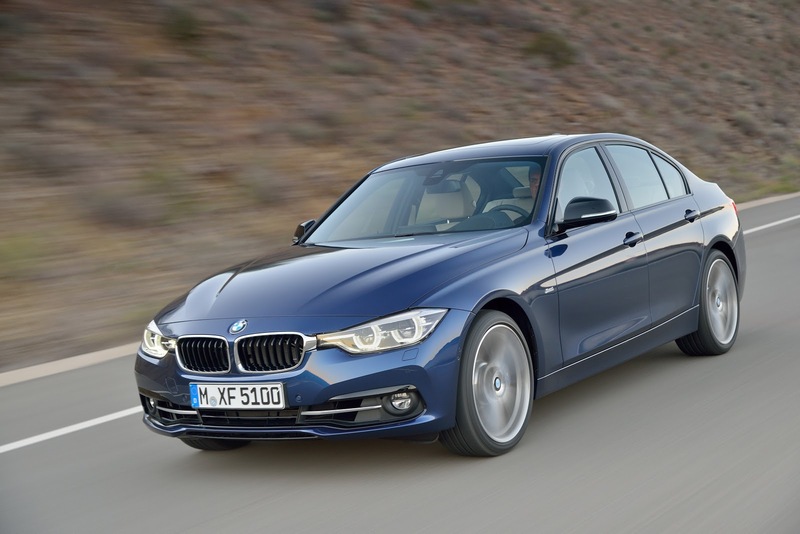 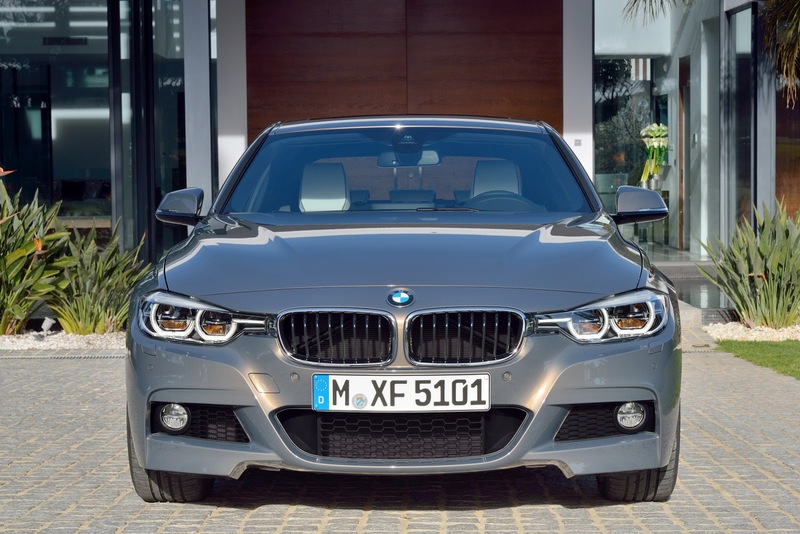 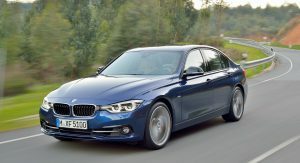 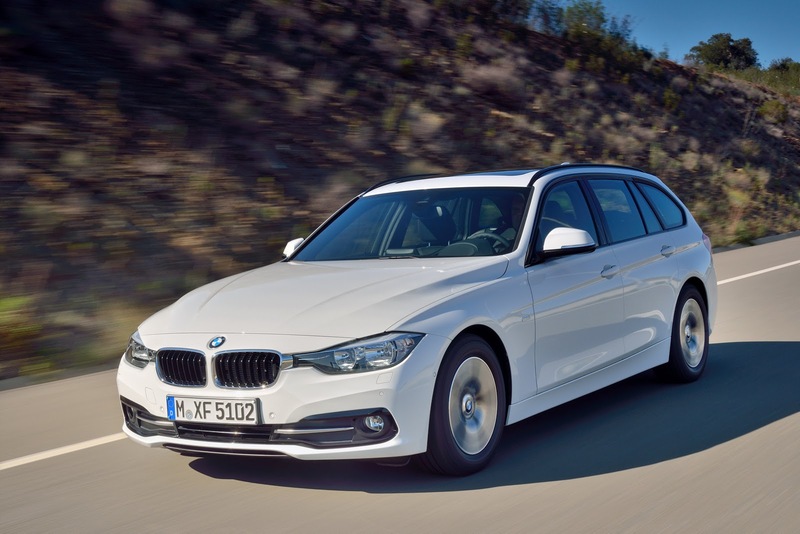 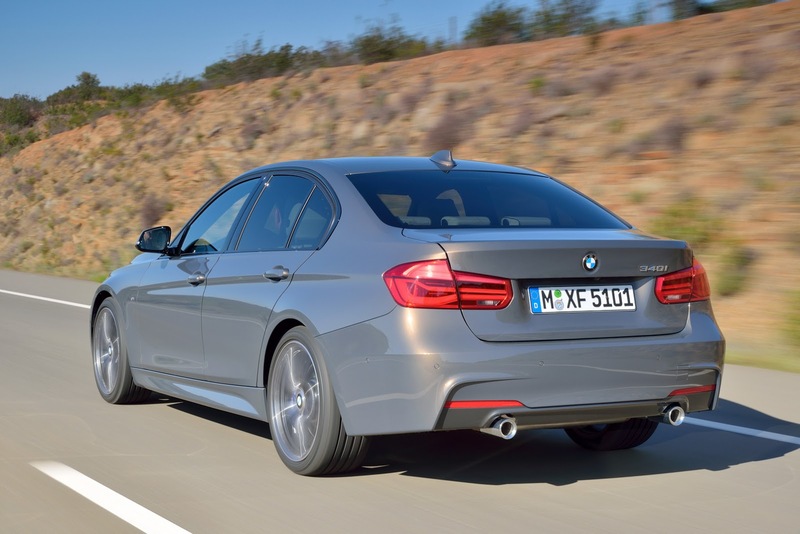 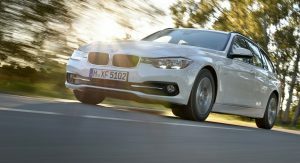 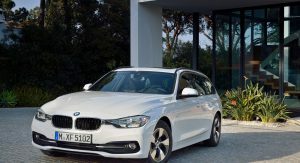 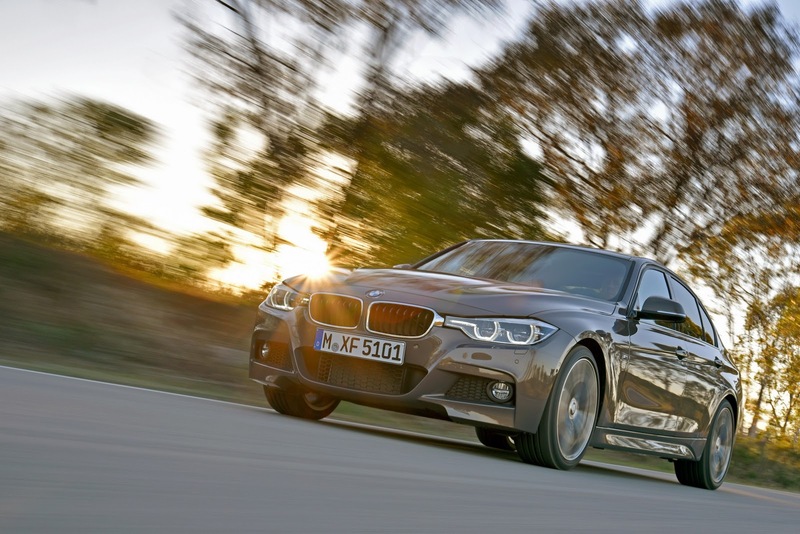 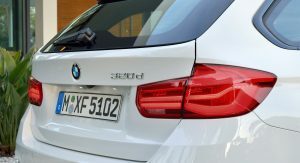 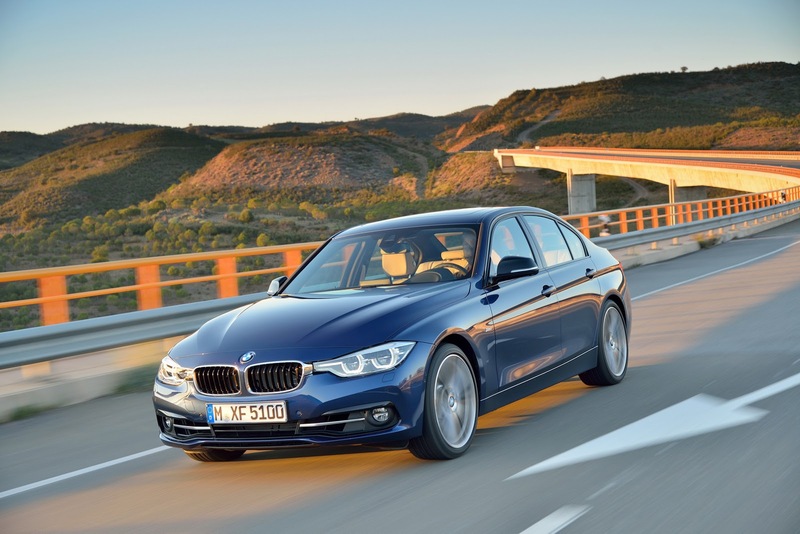 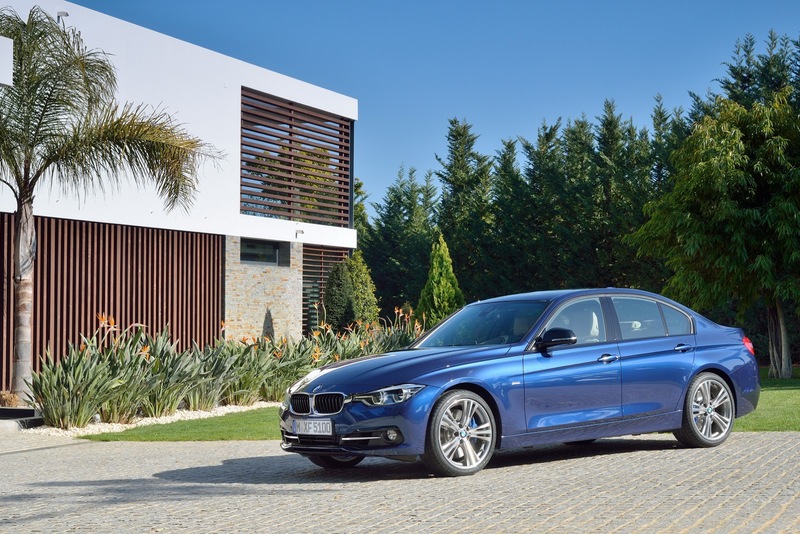 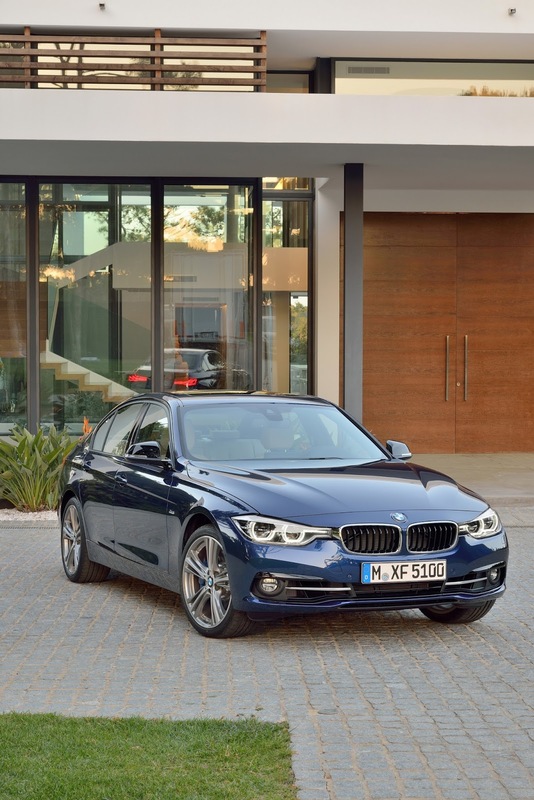 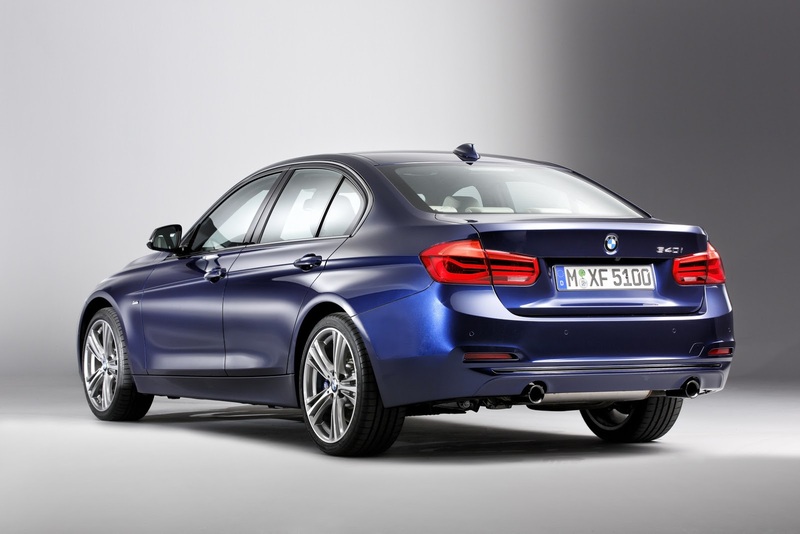 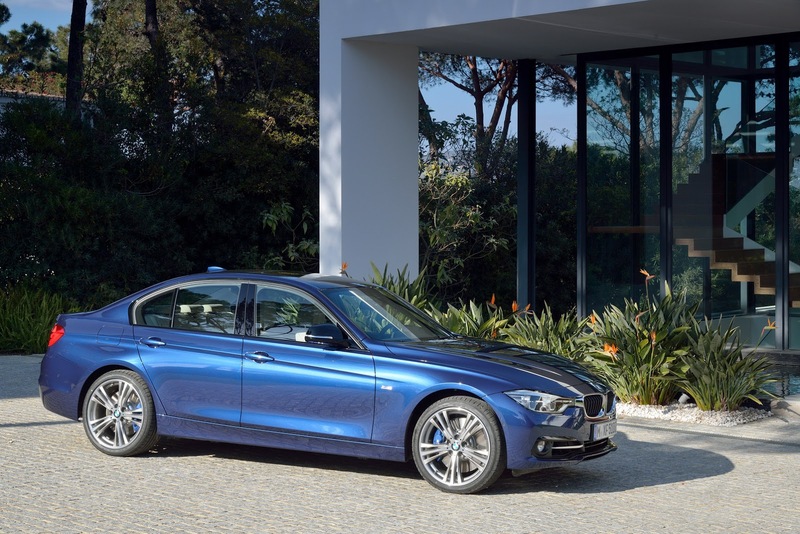 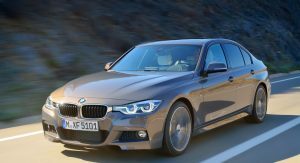 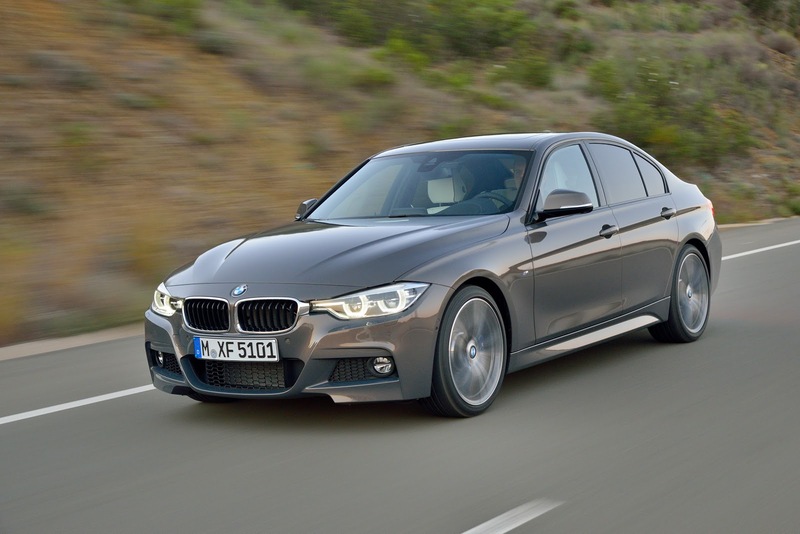 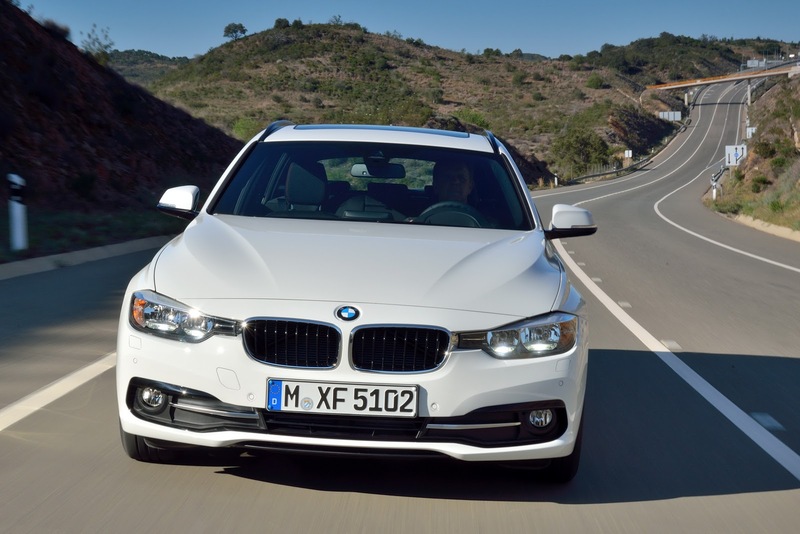 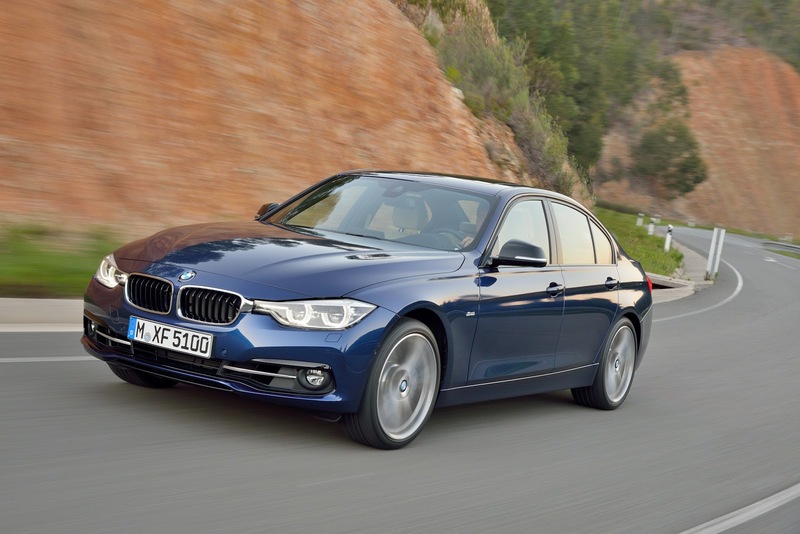 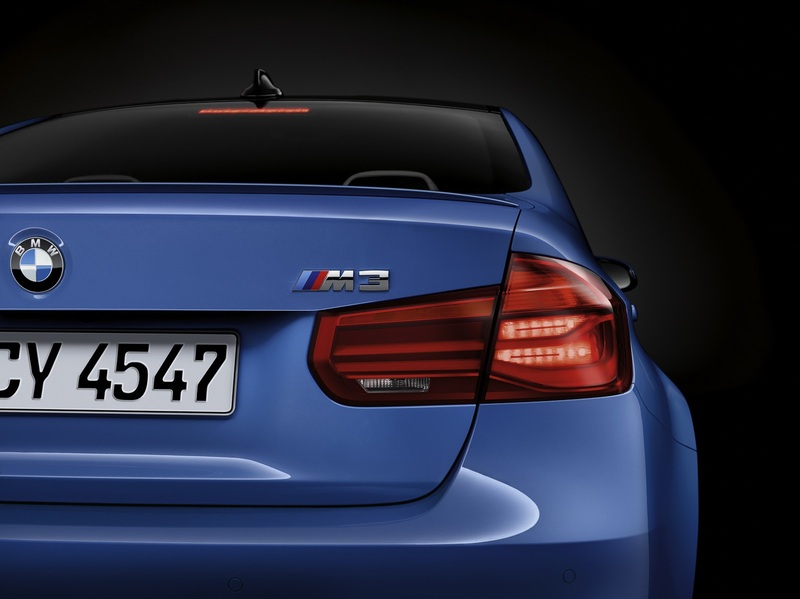 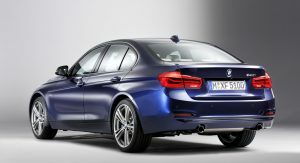 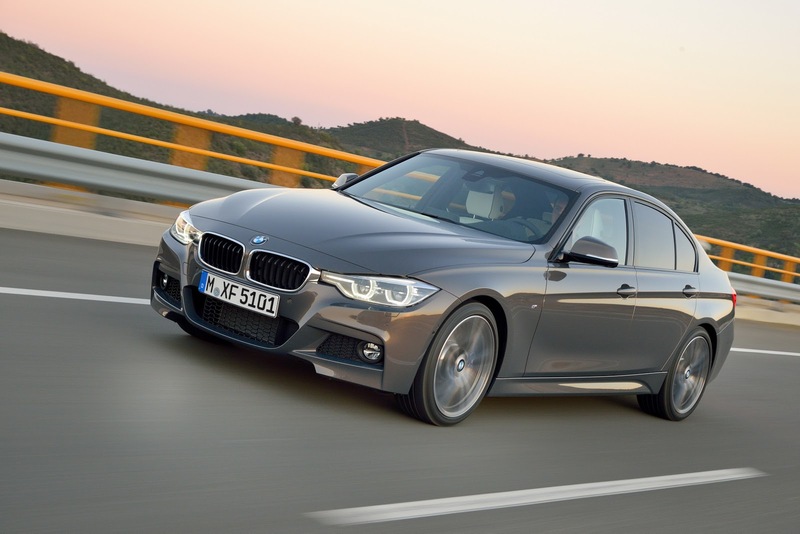 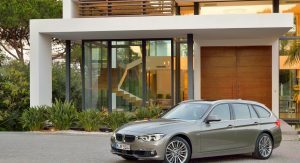 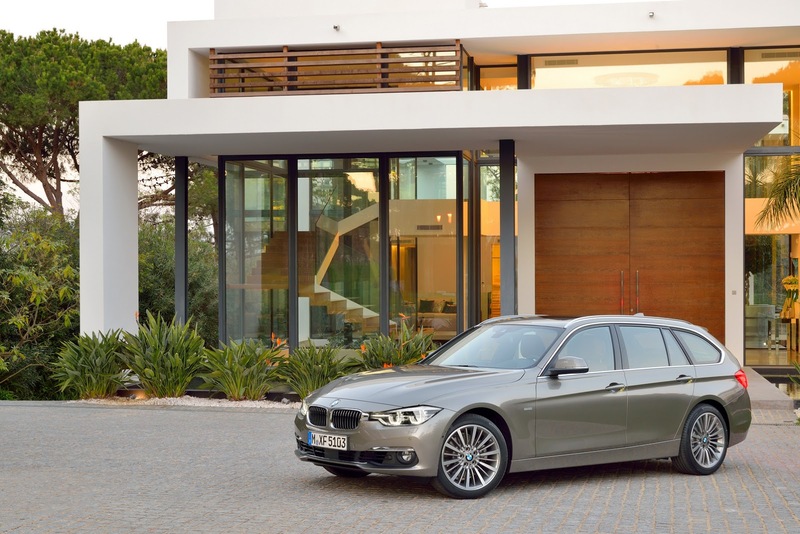 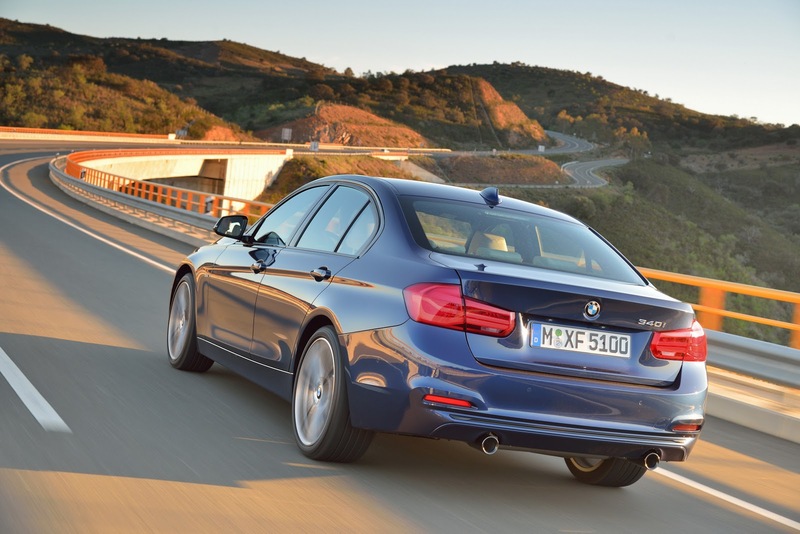 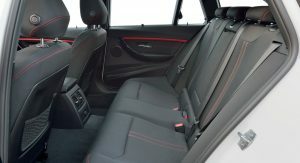 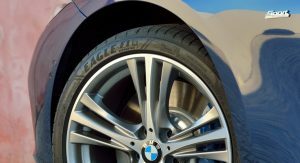 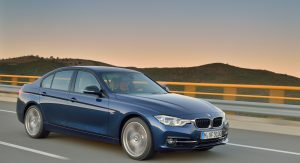 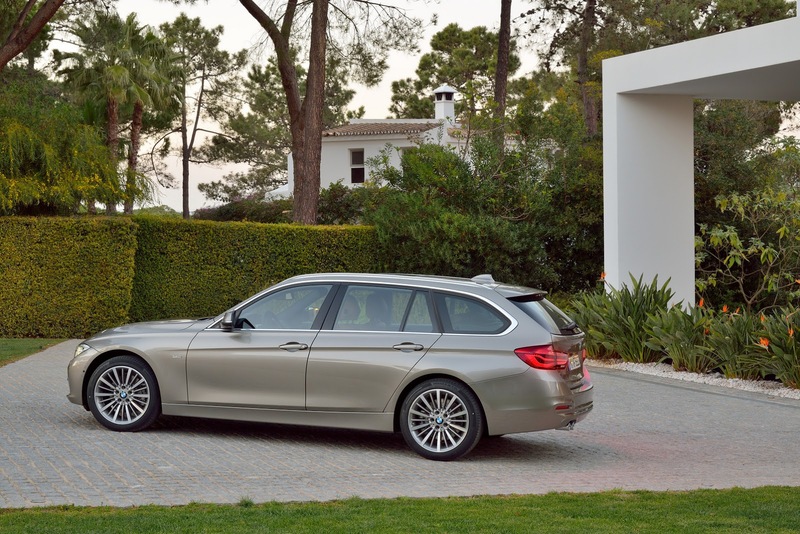 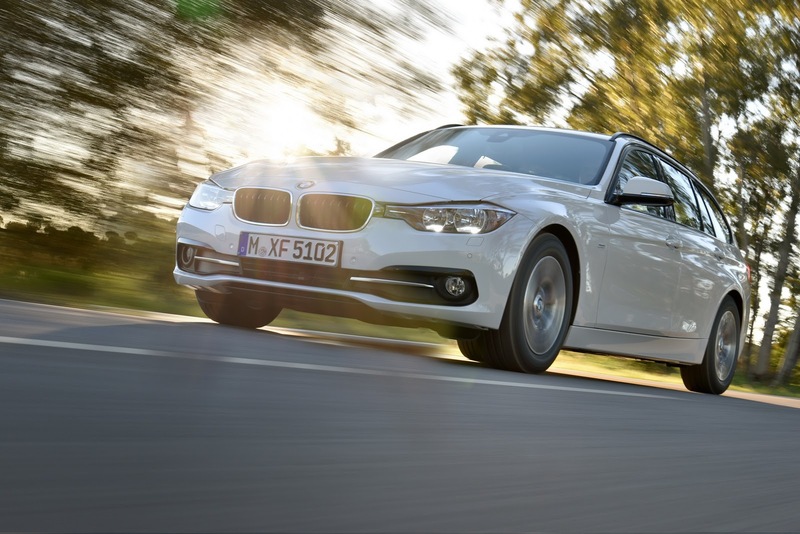 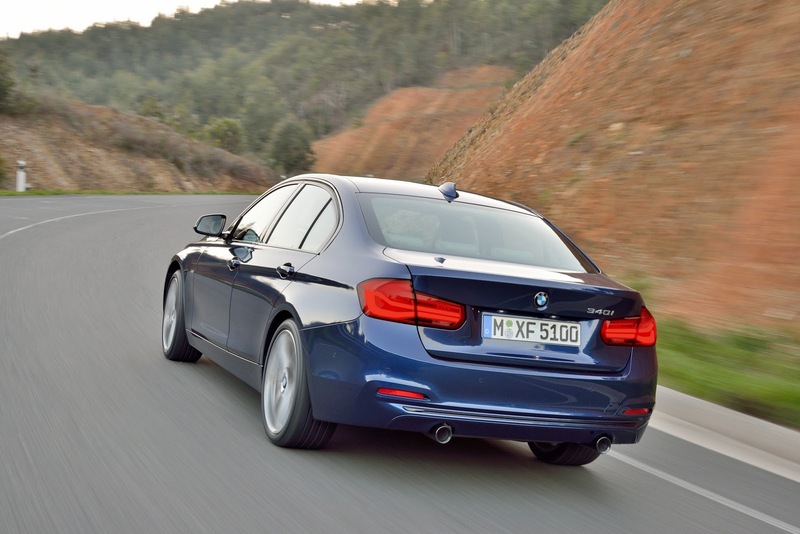 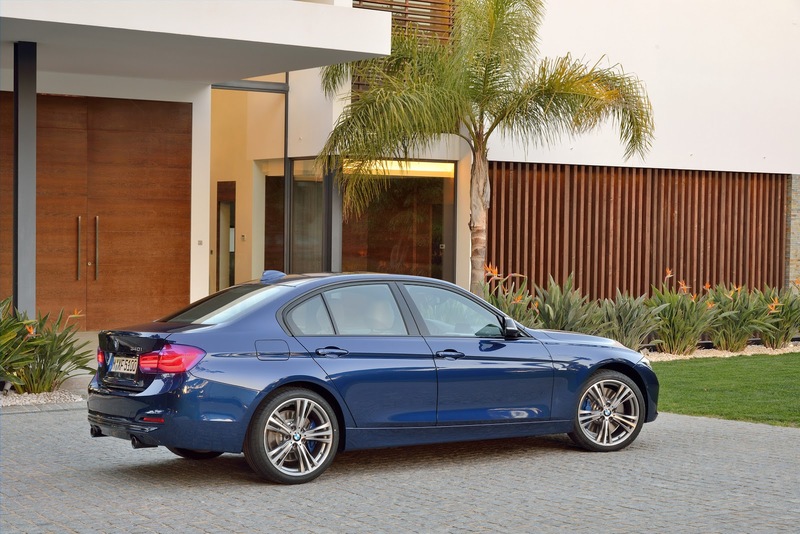 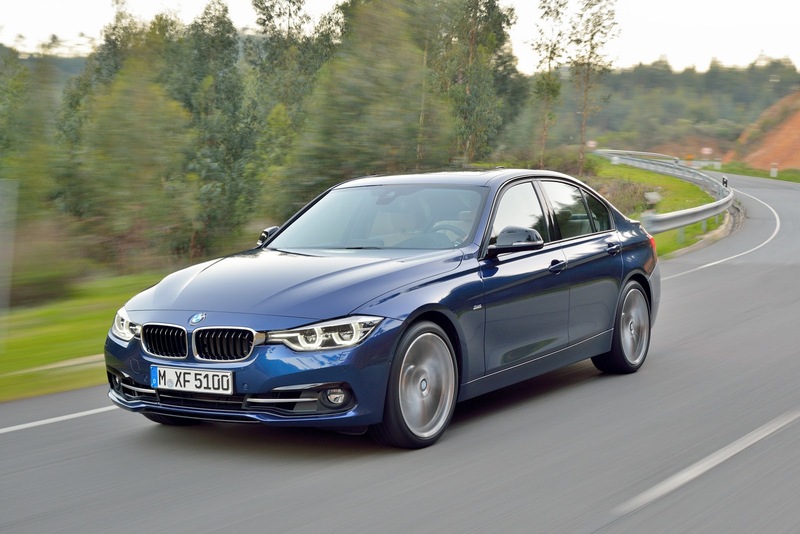 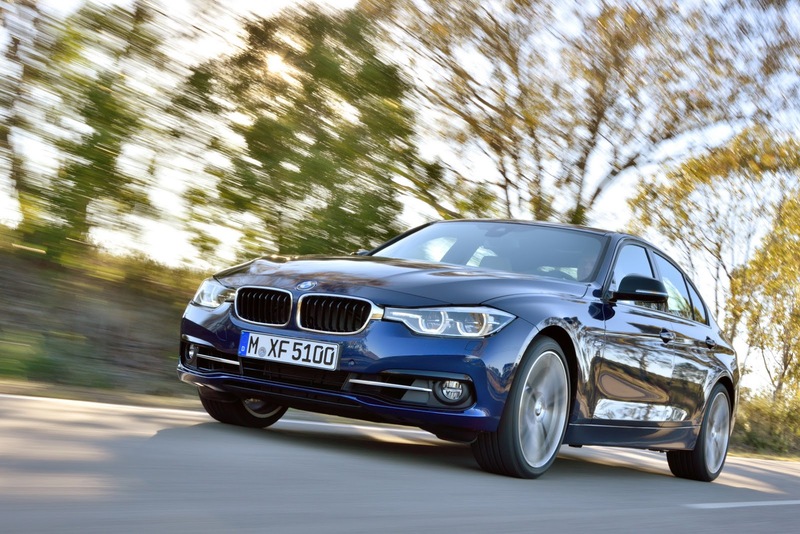 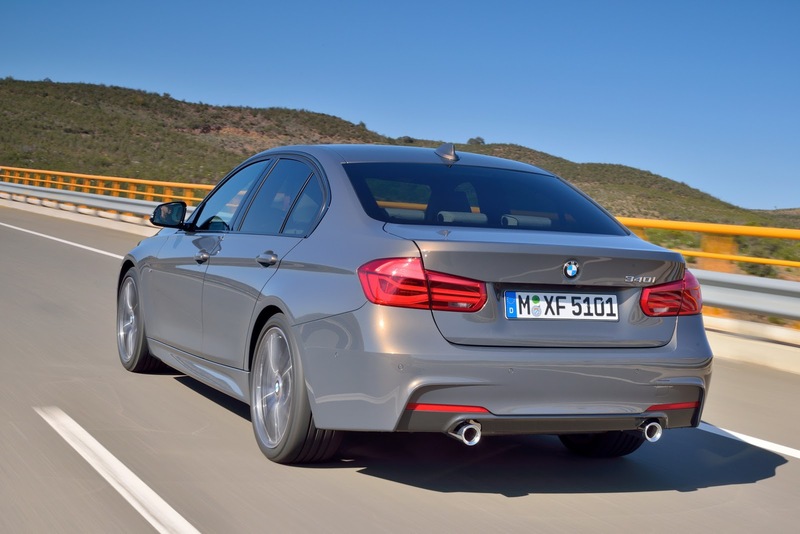 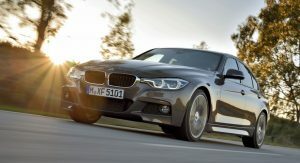 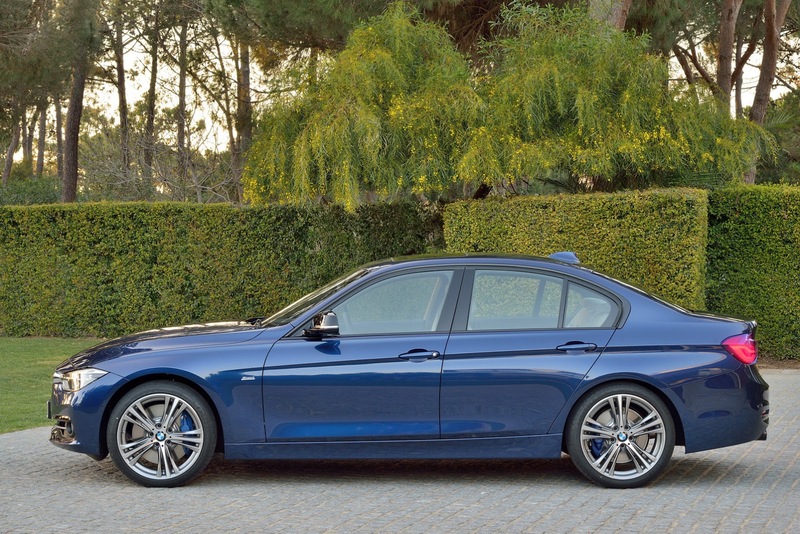 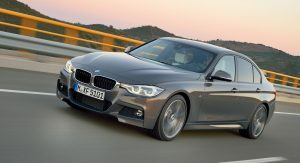 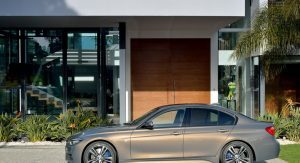 Do note that the 3-Series models featured in the gallery and the videos show the European specification cars. 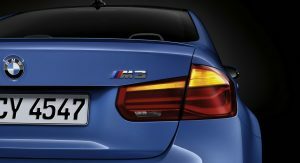 US pricing and availability has not yet been announced, but sales should start later in the summer. 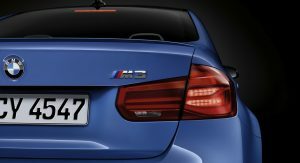 I assume BMW charges $900 for any of those three new colors. 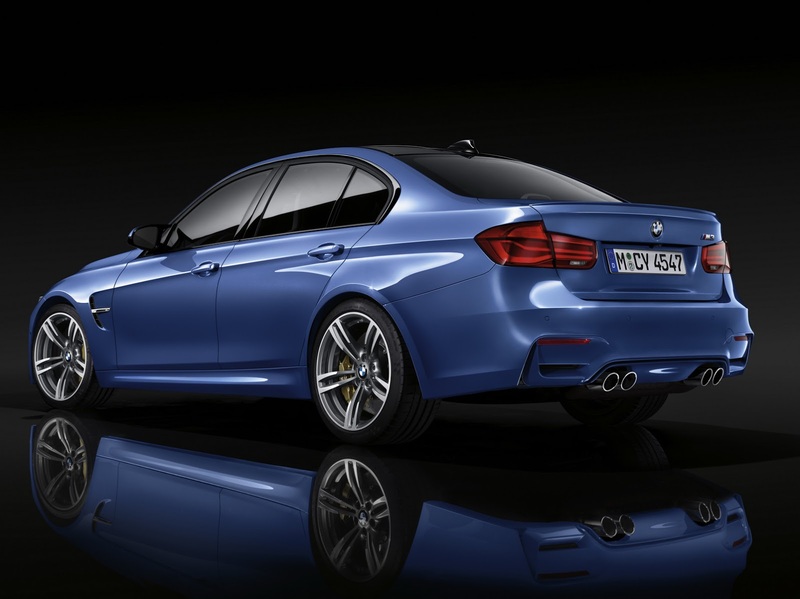 Spending a grand on the color of your car is a concept that continues to escape me. 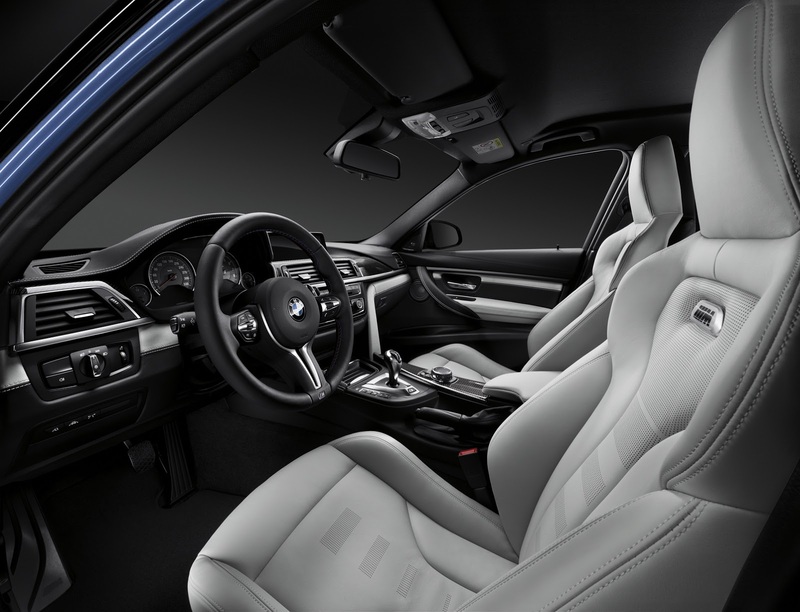 Why, when you can get Jet Black or Alpine White for free? 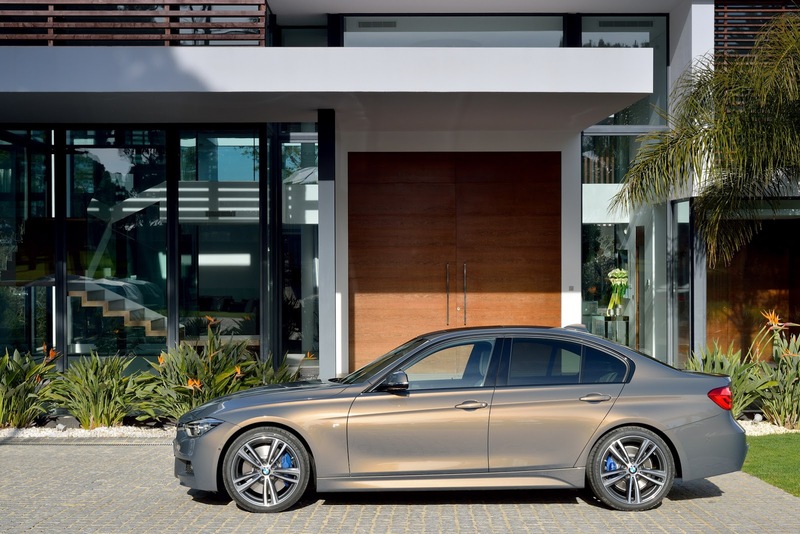 Zzzzz, I love BMW’s in theory, but in practice they’re highly unreliable, way overpriced, and phenomenally fast sports machines with slightly nicer interiors than a Honda Accord. 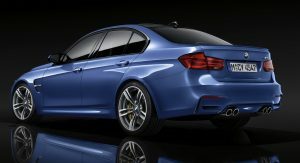 But good lord, 0-60 in 4.6 sec for a family sports sedan??!! 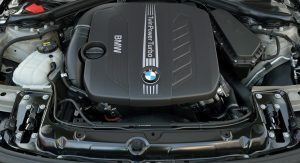 They really are seriously fast machines. 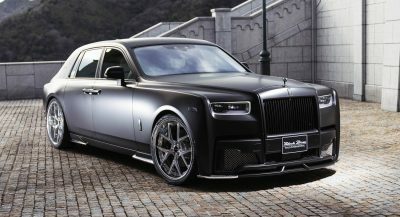 Much as I love their cars, I’m not rich enough to where value isn’t part of my equation. 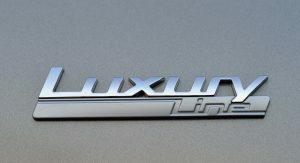 Just leased a $62k loaded GS350 F for $429/mo, $3k down. 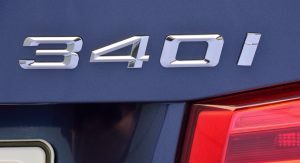 I’d never get a $62k Bmw near those numbers. 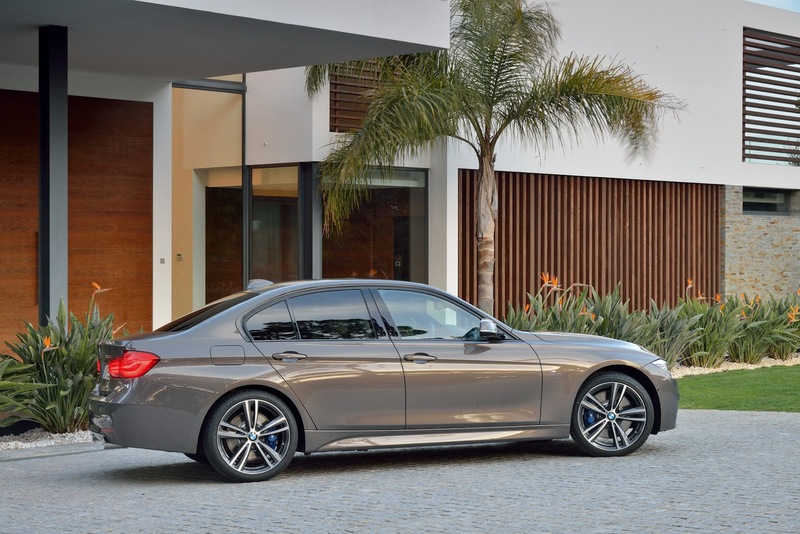 And that list doesn’t even include one of the sedan picks, the 5-series .. 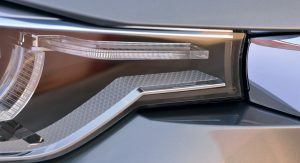 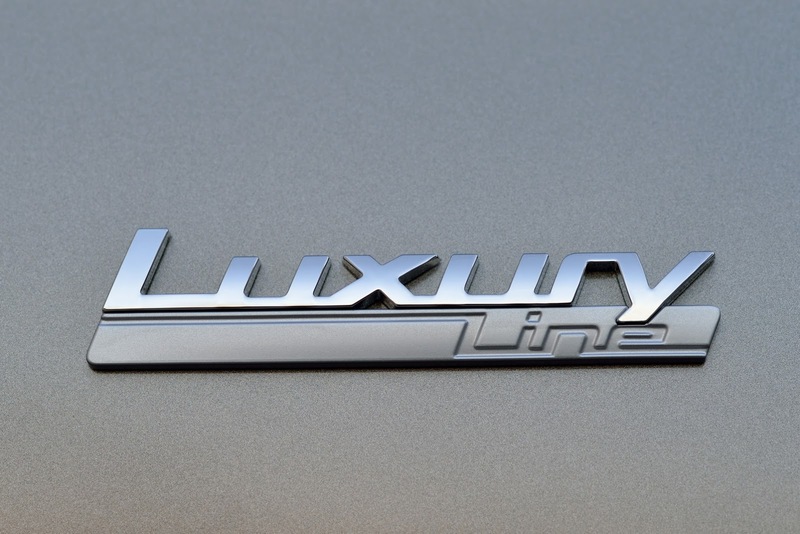 Sounds like that deal is because Lexus is trying to drive sales growth. 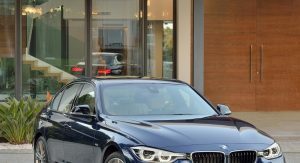 Congrats on your deal, thats great. 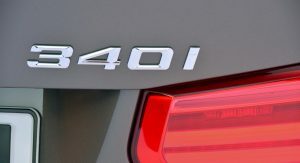 Great car. 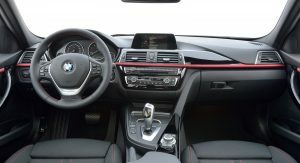 But when taken care of properly BMWs last very nicely. 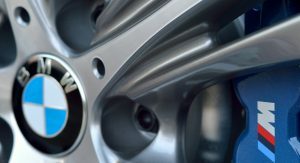 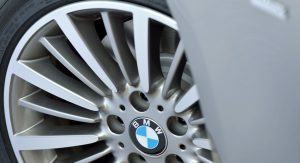 BMWs are, however, less forgiving than Lexus, Acura, Toyota, Honda and other traditionally reliable brands when not taken care of. 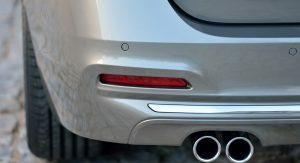 Next PostNext Polish Maserati Street Drifter Crashes Into Parked Cars!